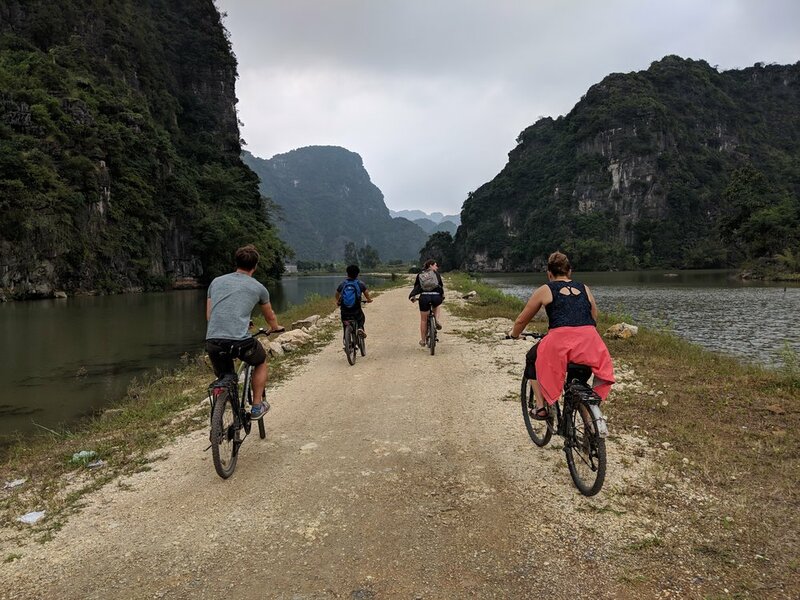 This blog took a long gap year- just like we did. 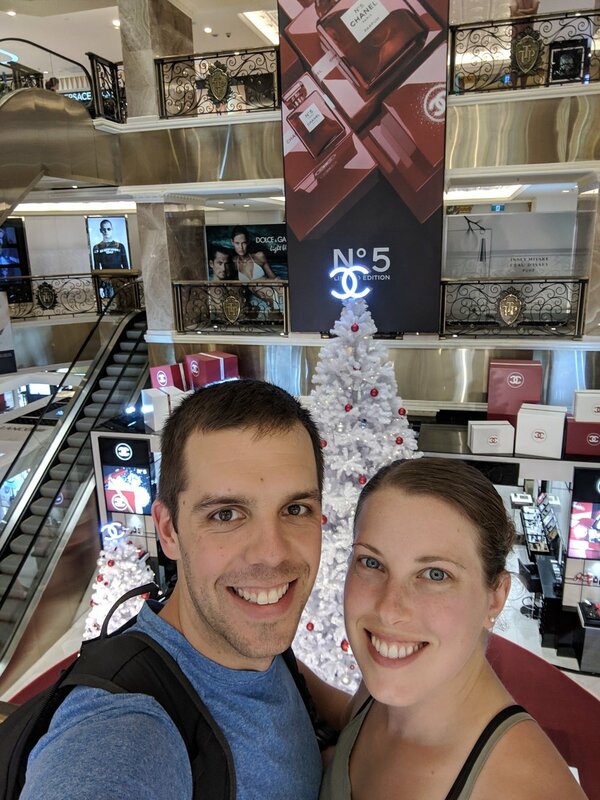 We haven’t been traveling since we settled down in Grand Rapids, Michigan in the Fall of 2017. Grand Rapids has been very good to us. I work for the Lower Grand River Organization of Watersheds. I have an incredible group of coworkers, and love my job. We also found an amazing group of people at CrossFit 616- you guys are awesome! 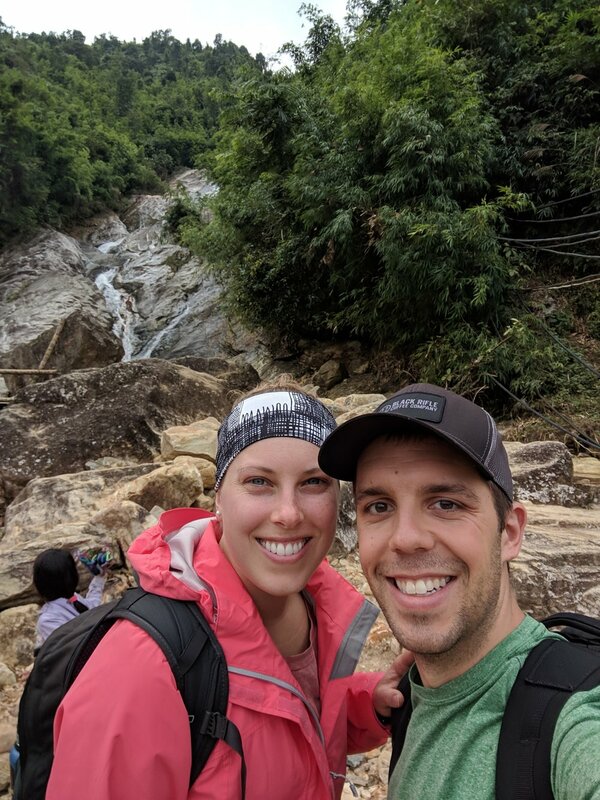 After a year of working, we finally took a vacation and decided to travel back to one of our favorite countries that we explored on our world-wide adventure- Vietnam. 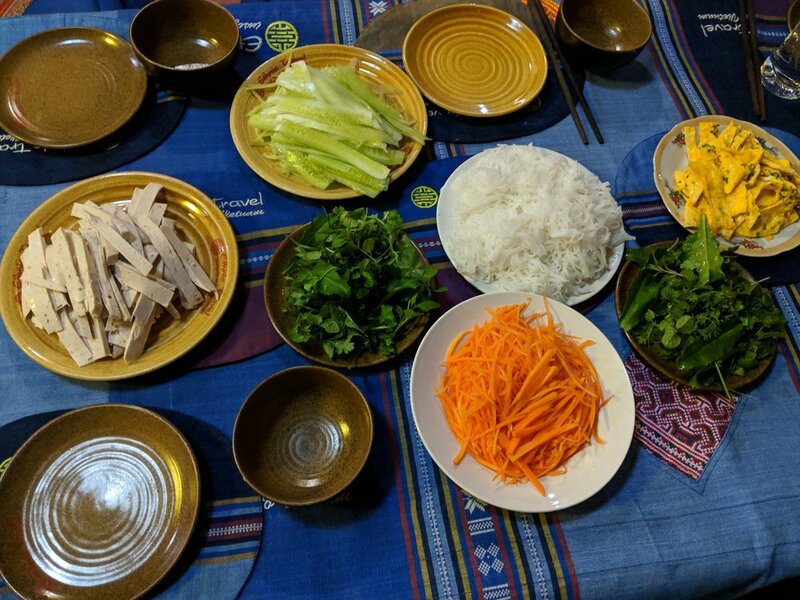 Our second trip to Vietnam was just as amazing as the first! Same same but different. Aka Southeast Asia’s way of saying ‘similar.’ Jeff and I traveled there alone this time, and I was worried that we weren’t going to have as much fun without any travel buddies. 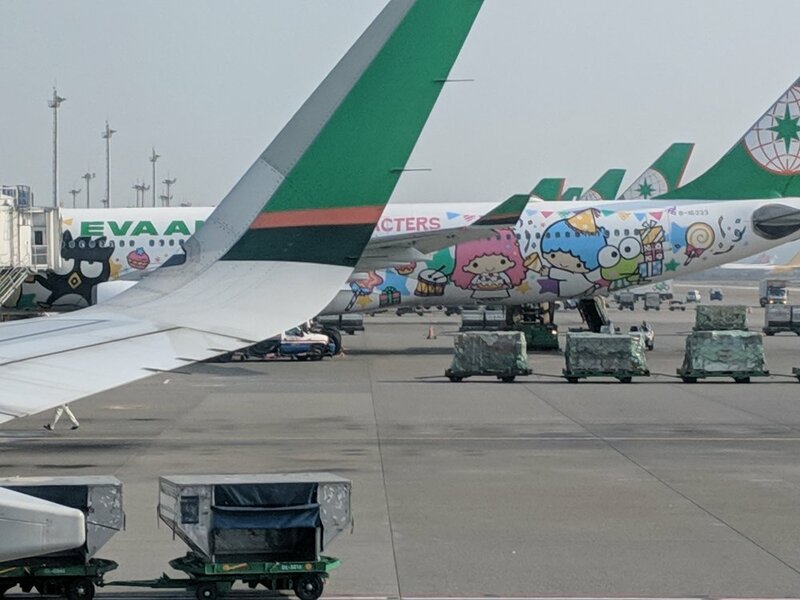 No need to worry, as the trip started off on the right foot- we caught up with our friends Matt and Rebekkah in Chicago before catching our flight on EVA Airlines, which was Hello Kitty themed. AMAZING! Just as amazing? The airport in Taiwan. We landed in Hanoi 2 days later. This city is nuts. 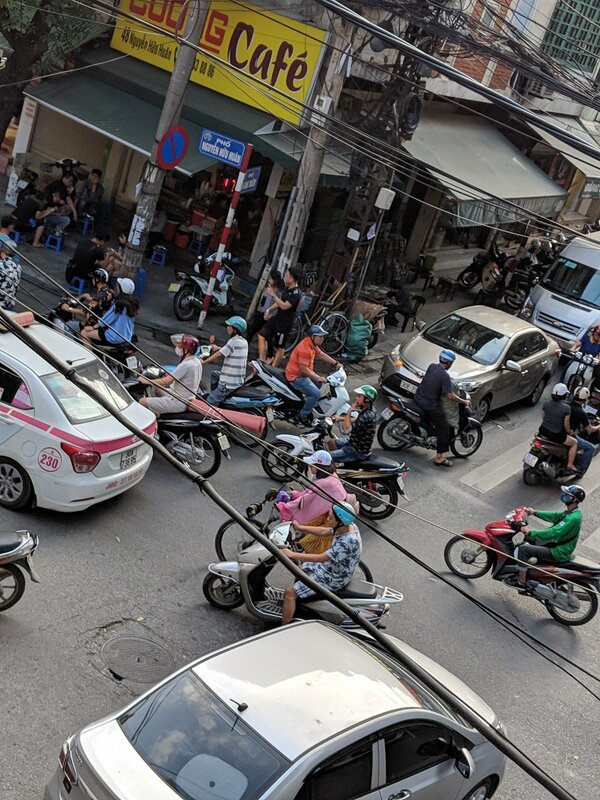 Traffic is crazy, it’s third world county polluted, and people seem to thrive. I’m not sure why, but I freaking love it. 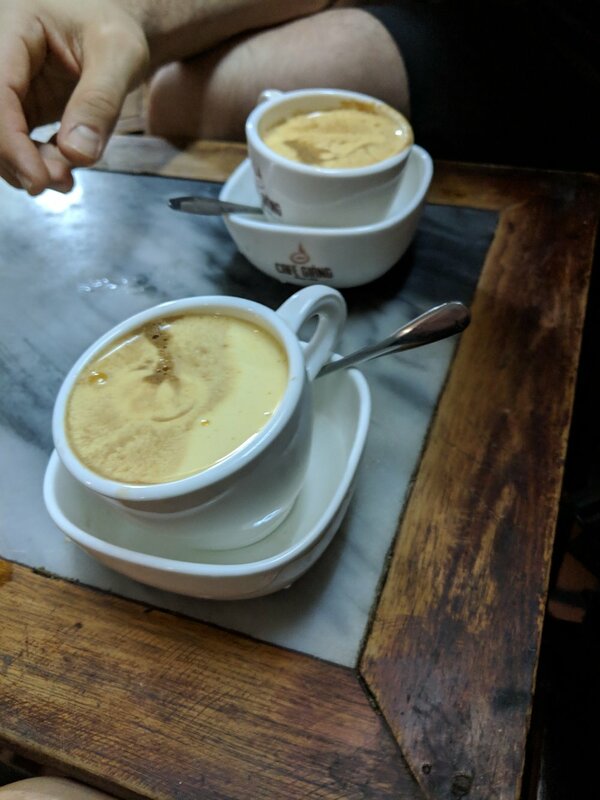 It probably has to do with the polite locals, delicious food, good shopping, and out of this world coffee. Coffee in all of its forms! Hot, cold, strong, stronger, with coconut milk, or topped with egg custard (our personal favorite!). We spent 2 weeks eating everything in sight. 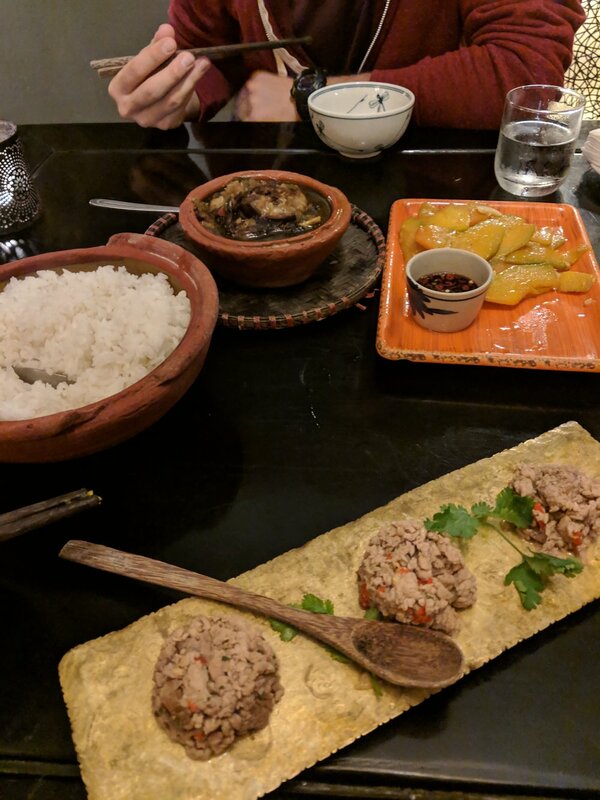 Including steamed snails that we had to dig out of their shells with a safety pin- don’t worry, we’re both up to date with our tetanus shots and I think the rice wine killed everything else…The snails were surprisingly tasty and of course we forgot to take a photo. While crossing the street, we have a rule- it’s every man for themselves. Meet you at the other side dear! 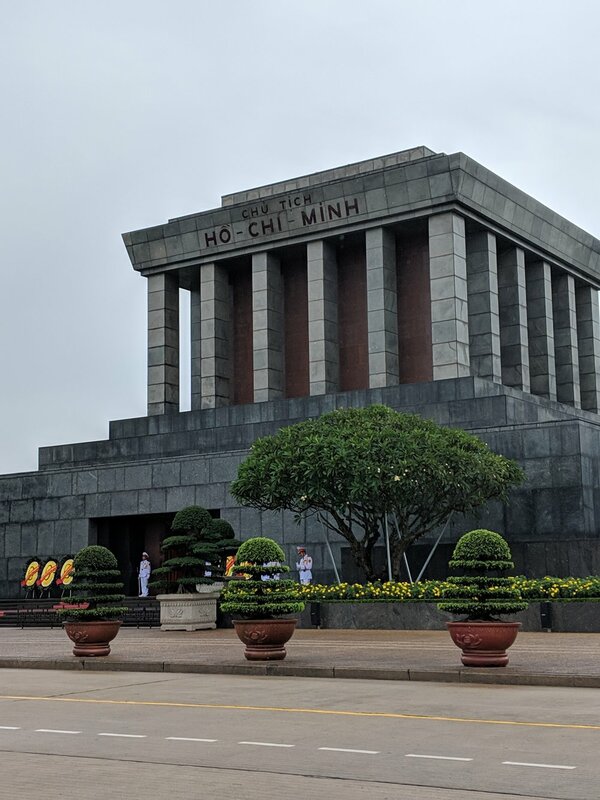 We spent 2 days in Hanoi before heading out on a 3 day excursion with Ethnic Travel that Jeff had booked. 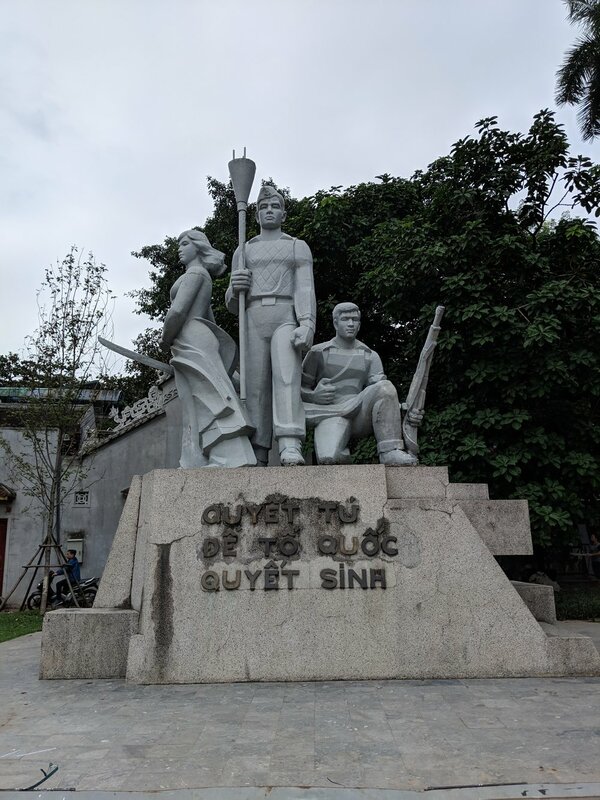 We visited Ninh Binh in the Red River Delta, and Bai Tu Long Bay (the northern part of Ha Long Bay). We had an amazing guide, and a great time! 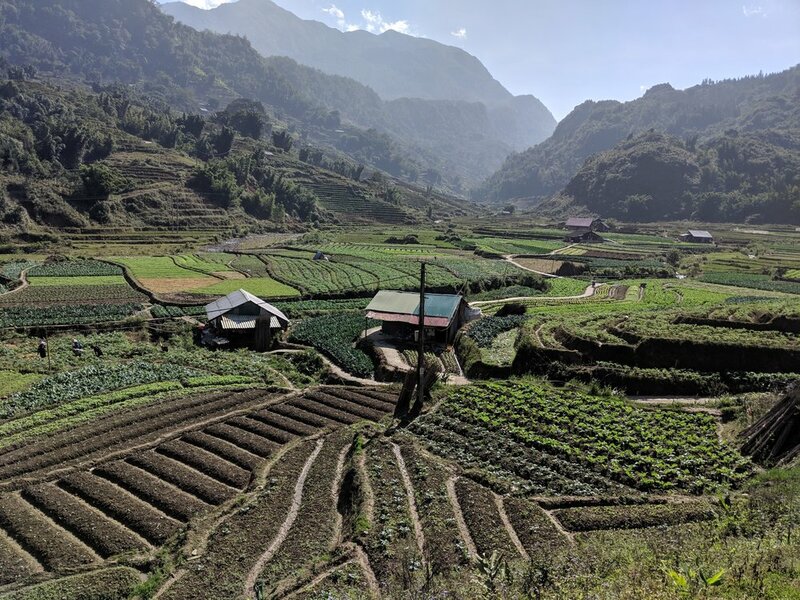 We returned to Hanoi for another 2 days before heading out on a second trip, spending 3 days in Sa Pa with Vega Travel. 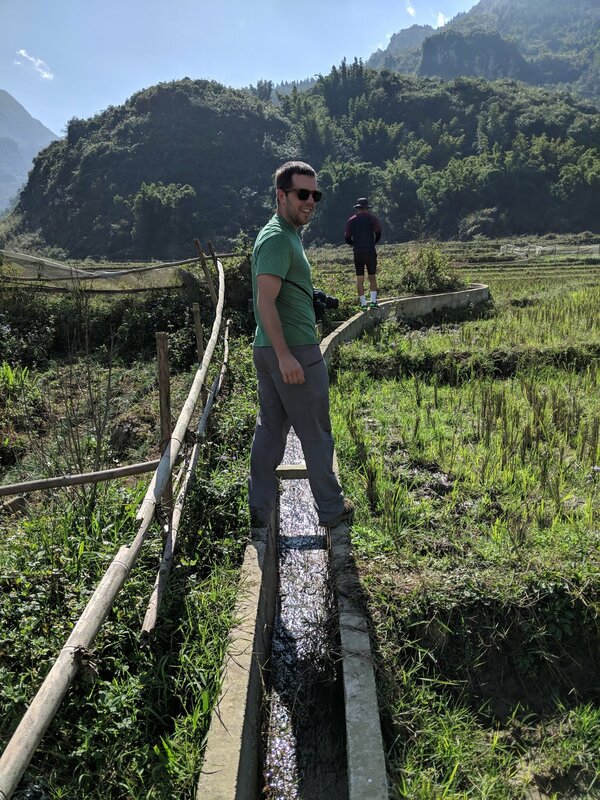 We took the night train from Hanoi to the Chinese border, and spend the next 3 days trekking and scooting around the rice paddies in Sa Pa. We couldn’t believe our luck with the incredible weather. Note: almost all of these photos are NOT edited or filtered. This place is just that breath-taking! 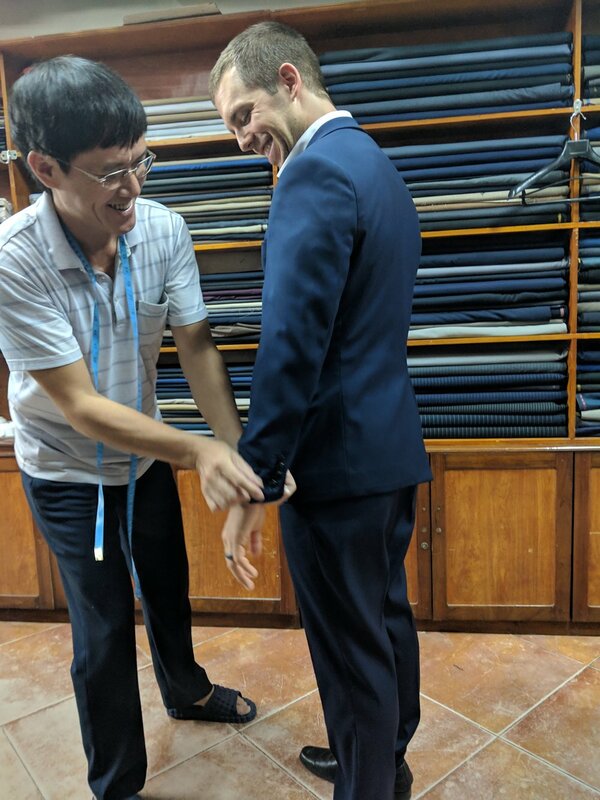 Jeff got a suit made! Do we still have wanderlust? Hell yes. But now it’s a little bit different- during this vacation, I was happy to have a place that we call ‘home’ that I actually wanted to go back to! What’s up for 2019? We are heading to Costa Rica in April- Pura Vida! We were on vacation. We didn’t keep track because we didn’t have to. 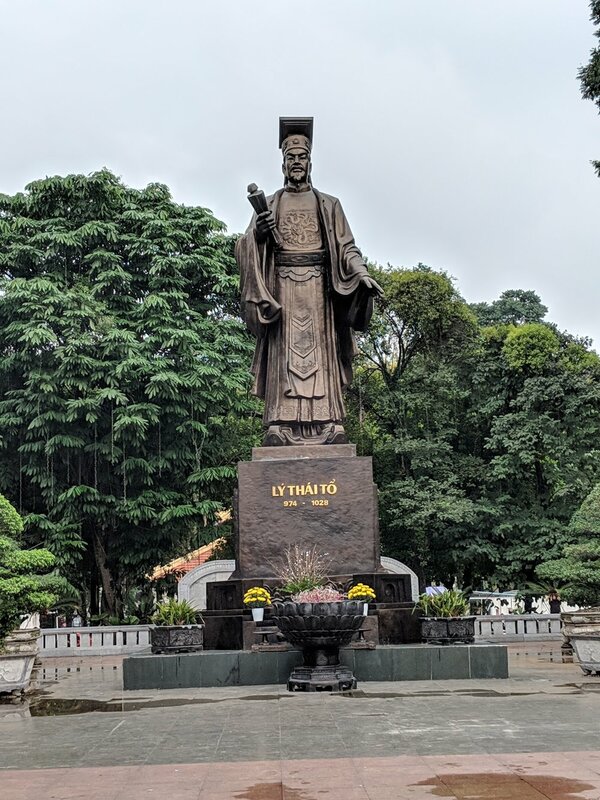 But Vietnam is so cheap after you get there, that you have to try to break to the bank. Example: I was peeved because one day a lady on the street scalped us for a 1.5 liter bottle of water. 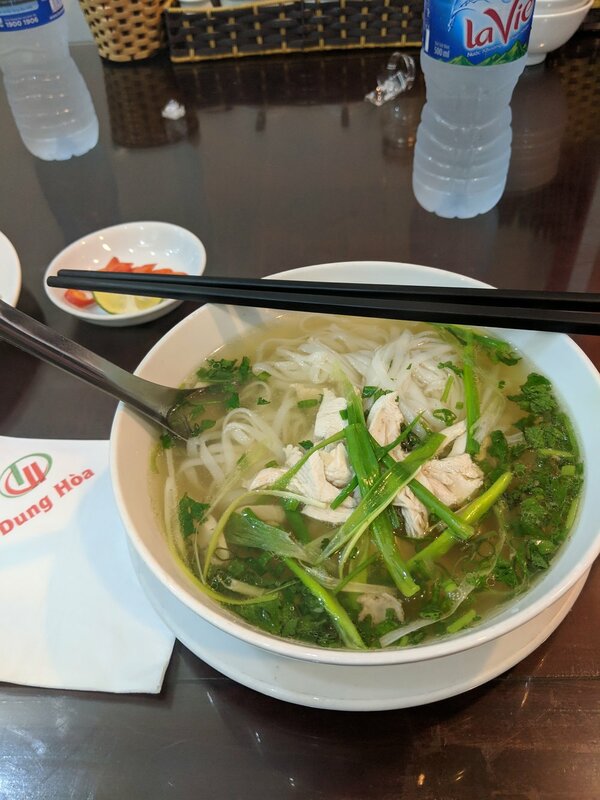 She charged us 30,000 Vietnamese dong (double what she should have). It cost us $1.28. But in reality, we did way better than I could have expected. Now that we are back in the States we have rolled into using the money we tucked away just for this purpose, the cushion we left to float until we get jobs. I can officially close out our books on the travel portion of the trip, and lay out exactly how well we stuck to our planned budget. The starting available budget might seem like a strange number, but we ended up having more vacation time to cash out when we left then we thought and since I have been nerding out over the finances, I used the exact amount we actually had in the bank after subtracting our return cushion and car funds, rather than rounding off to a nice number. Hooray for spreadsheets doing math for you so it doesn’t matter if the numbers don’t look nice! 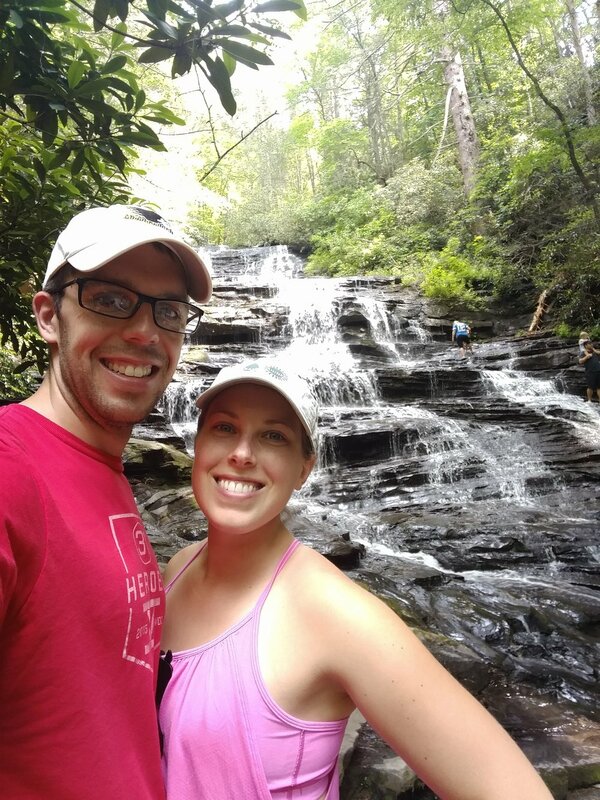 So in traveling for 410 days, we spent a hundred dollars more than we wanted to. Or if you break that down, about a quarter a day extra. I wouldn’t have guessed that we would be that on the money. Ever. Looking back, I thought we would be under budget around the halfway point, but then we allowed ourselves a few more expensive stops/dinners/rides/etc. since we could afford it. The three cheapest? England (thanks to our wonderful friends Phil, Mavis, and Winter for hosting us for so long), Ireland (WWOOFing…), and Thailand. An honorable mention goes to Finland, the daily total there gets skewed pretty far due to my method of including transportation into a country in the total for that leg of the trip and the plane tickets into Finland from the USA being really expensive. If those were eliminated it would be really cheap, thanks again to staying with awesome friends! Both of us couldn’t believe that the end of our trip was quickly approaching! We had been talking about going to the Bahamas with our close friends from Virginia for the past few years and knew it would be a great and relaxing way to end our world tour. After spending time with Jeff’s sister in Atlanta, we flew back to Fort Lauderdale, FL to meet up with everyone and head to the islands! We spent a few days catching up with everyone, relaxing by the pool, and collecting provisions to take with us to the Bahamas (hello Costco!). We had some great meals (including candied bacon!!!) and the resident duck at the hotel had some chicks while we were around (see above). Early Saturday morning, we packed up, piled in the church van, and headed to the airport! Since we were flying out of the executive airport, we could take whatever we wanted (food) with us without going through security, and then lounged around the waiting area like celebrities until our pilot was ready. Jeff was our co-pilot for the first flight! 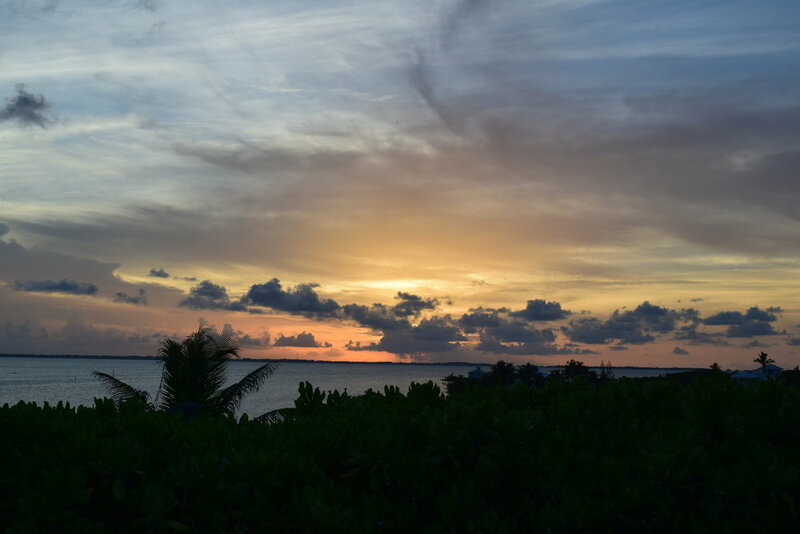 We landed safely in the Abacos, and got shuttled to the marina in Marsh Harbor. Note: with 12 people, 1 baby, all of our luggage, one grocery stop and 2 crazy islander taxi drivers, this proved much more interesting and entertaining than you might think. After 2 trips on the boat to Elbow Cay, and a few pina colodas- we all finally made it to our home for the week! We had a fabulous week hanging out with our best buds in paradise. Jeff, Andrew, Christine and I snorkeled every day in front of the house and were able to see reef sharks, Bob and Bartholomew the barracudas (yes- they’re named), and tons of other cool fish. A few of us went scuba diving right from the house! 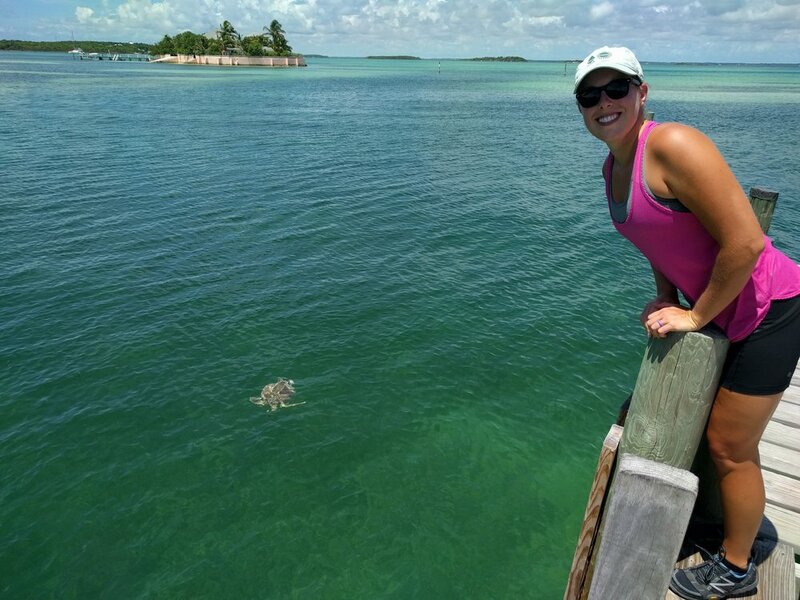 Jeff and I even saw sea turtles from the dock (below right)! I was in heaven sitting on the deck or beach, reading my book every day. Jeff went fishing one morning with Chris, Jason, Joe, Andrea and Jessica. 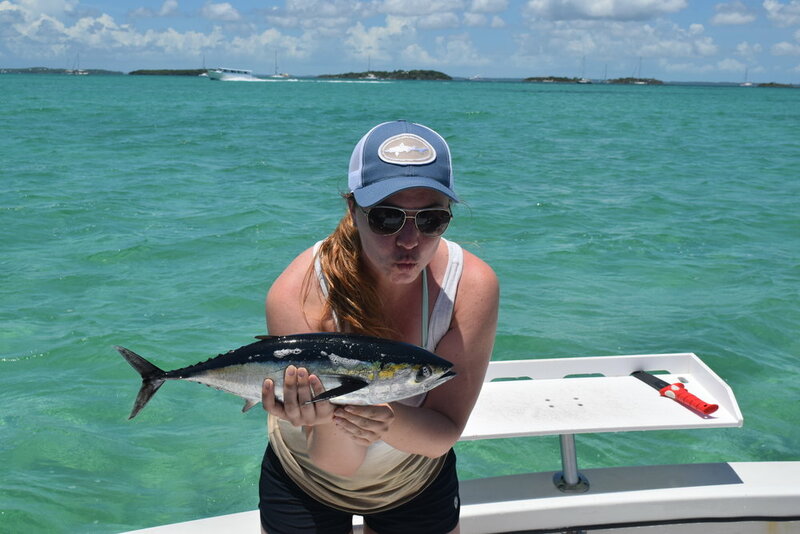 They caught enough tuna, mahi and wahoo to keep us in ceviche for the rest of the week! Liam was born about 2 weeks before we left Virginia. He still isn't amused with Cara's selfie skills... but boxes are awesome! 12.5 people, cleaned up nice: Jason, Emily, Joe, Liam, Amy, Penny, Chris, Jess, Dre, Cara, Jeff, Andrew, and Christine. Once in awhile Jeff and I can get cleaned up! The hardest part about leaving Virginia was leaving our friends. 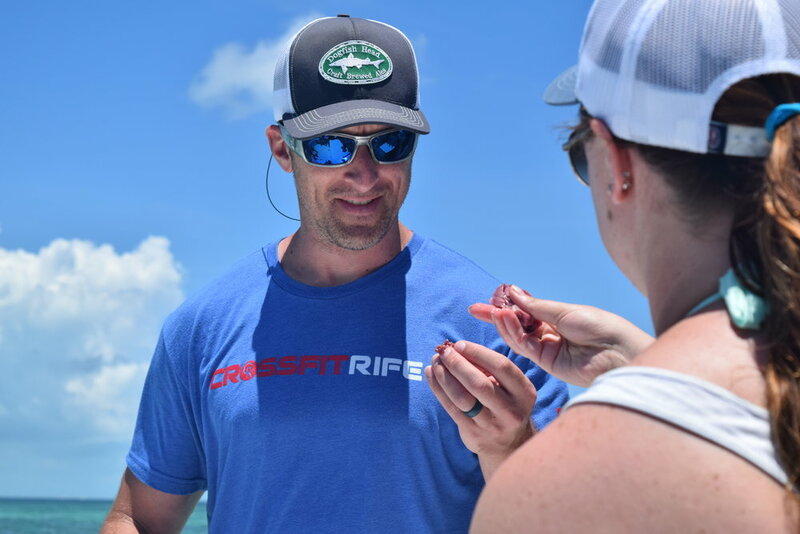 This week in the Bahamas was awesome- and we are so happy that we could reminisce about old times and make new memories with all of you at the same time. We love you guys and can’t wait to see you again soon! Golf cart cruising, lots of landscapes (waterscapes? ), and another sign (literally...) that its a small world. Jeff's hometown made it onto one of the sign posts. Oh, and fish, because its delicious. Sometimes life calls for a grilled peanut butter and jelly sandwich, and it's best to answer that call. After minor delays, and 2 flights, we made it safely from Peru to Atlanta! We spent a great week with Jeff's family, assimilating back into American society by eating all of the chips, salsa, and ice cream we could get our hands on. We went on picnic lunches, hiked, spent time searching for jobs in the Midwest, and played games. Jeff's parents brought us a whole box full of our clothes that had been sitting in their basement for the past year- after wearing the same shirt for a year, it was like getting a whole new wardrobe!!!!! Many thanks to Nick and Stephanie who housed and fed us for 2 weeks! During the second weekend back, we rented a car and drove a few hours south to see some college friends who live in Florida. As we drove through Montgomery, Alabama, I saw a sign along the highway that read, 'First White House of the Confederacy.' I had Jeff pull off the highway to do a drive-by. Of course once we got there, I wanted to go inside. We were greeted by a very enthusiastic Confederate Historian. After spending a few minutes walking through the house, we drove around the corner so I could take a picture of the Martin Luther King Jr's church. It was a great pit stop! For dinner that night we stopped somewhere in the backwoods between Alabama and Florida for roadside BBQ in a gas station parking lot. The ribs were fantastic! The good Google reviews were on point for this place! We had a wonderful time visiting with Hans, Nora and their adorable daughter Adrienne. The weather was great, and we explored a small museum in town, rented a boat for an afternoon, walked the beach, enjoyed bottomless mimosas, and Nora and I went to the flea markets. Thank you so much for being awesome hosts- it was so wonderful to spend time with you! Here is the full photo with all of the pictures we took with our Michigan Tech flag in each country around the world- some complete with other Tech grads! We ended our time in South America by staying in the Miraflores district of Lima for 2 weeks. We rented a really nice Airbnb in the fancier part of town. It was great! 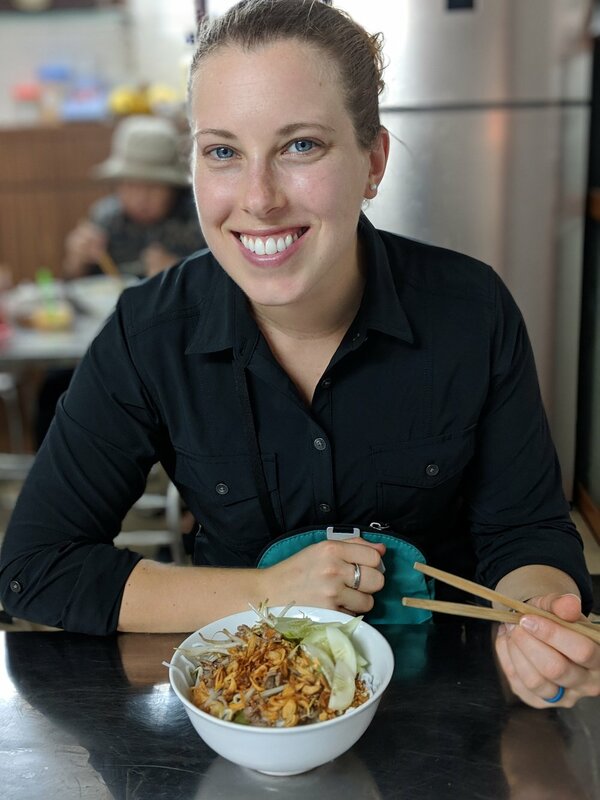 We celebrated our second wedding anniversary the night we arrived in Lima- Jeff took me out to a really nice restaurant called 'Panchita' and it ended up being our favorite meal in Peru! We liked Panchita's so much that we went back and ate there on our last night also. Below: Jeff ordered Adobo (traditional stew, served with rice, and I ordered steak that came with plantains, eggs and shoestring fries. Complete with a few glasses of wine! Altair CrossFit was 3 blocks from our apartment, so we dropped in while we were in Lima. Turns out, the key to fitness is not eating your way around the world for 12 months. Both of us were extremely happy to lift some (light) weights again. It’s a really good thing that CrossFit is a universal language; the classes were entirely in Spanish, but we’re pretty good listeners and just followed along. Thank you Altair for letting us drop by! One afternoon we walked from our place to the coast. There is a super fancy shopping mall called Larcomar built on the cliffs of Lima overlooking the sea. We also explored the Barranco area, which is the ‘hipster’ neighborhood of Lima. 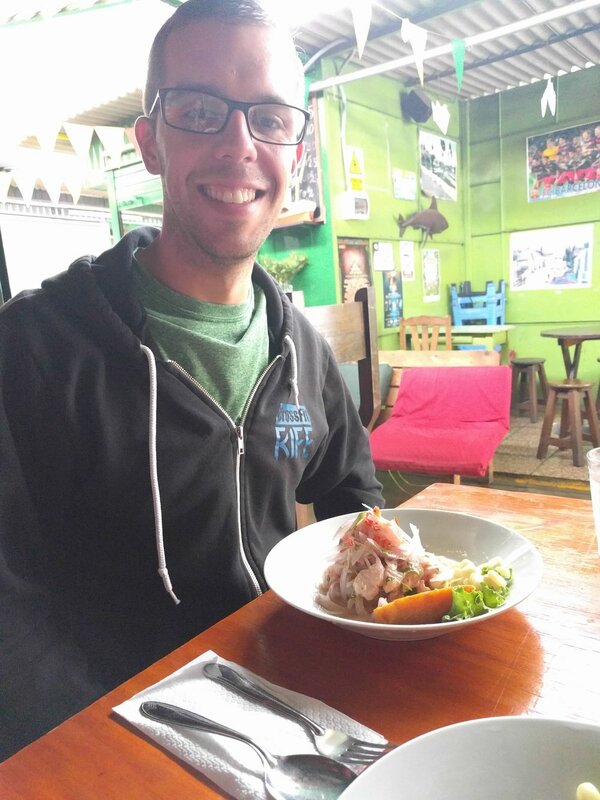 Jeff found a hole in the wall place in Barranco for ceviche- and it was delicious! While walking we passed Waikiki Beach (behind me and down the cliff). Now we have been to Waikiki Beach in both hemispheres! Note- the cloudy weather is typical for this time of year in Peru (beginning of winter); we haven't seen the sun in 14 days! There are pre-Incan ruins right in Lima! One afternoon we took a short 15-minute walk from our apartment to visit Huaca Pucllana. For about $4 each, we got a tour of this adobe settlement from the time of the Lima culture (200-700 AD). It was amazing to see ancient ruins amid the skyscrapers. It is an active dig site; there is about 30 more years of work to be done in order to uncover the entire settlement. It’s pretty cool because their building techniques have outlasted centuries of earthquakes. Sights from the walking tour- we made a pit stop for fresh churros! While the bus is a pretty effective method of transportation (stations are run like subway stations and there are separate bus lanes in part of the city to bypass traffic), paying for tickets wasn’t. The tour guide from our walking tour just told us to give our exact change to a bus worker at the station and they would help us through the gate- well, it didn’t really work like that. In order to use some of the buses in Lima you need to have a reusable bus card. They don’t sell 1-time tickets. Since we were only using the bus a total of 4 times, we didn’t want to buy the nonrefundable card for 5 soles. So when we went to get back on the bus after our tour, I told the station worker we didn’t have a card, but wanted to ride the bus. She ended up giving our money to a random person who was re-loading their bus card at a machine and then this person ended up swiping us in! Apparently, this is normal, as when we went to ride the bus again the next day we were again at the mercy of strangers to take our money and have them swipe us into the bus station. Surprisingly, strangers were extremely helpful and no one seemed put out that had to help the gringos on the bus! On one of our last nights in town, we braved the bus again and went to the Parque de la Reserva to see the fountains. For a little over $1, we entered the park to see the 13 fountains all lit up. It was great! They also have a water/light show that runs a few times each night. I included one of the fountain descriptions from a sign because I thought it was great! Not sure what 'unique acoustic flowers' are, but the fountain was pretty! We had a really nice 2 weeks in Lima and it was pretty low key. 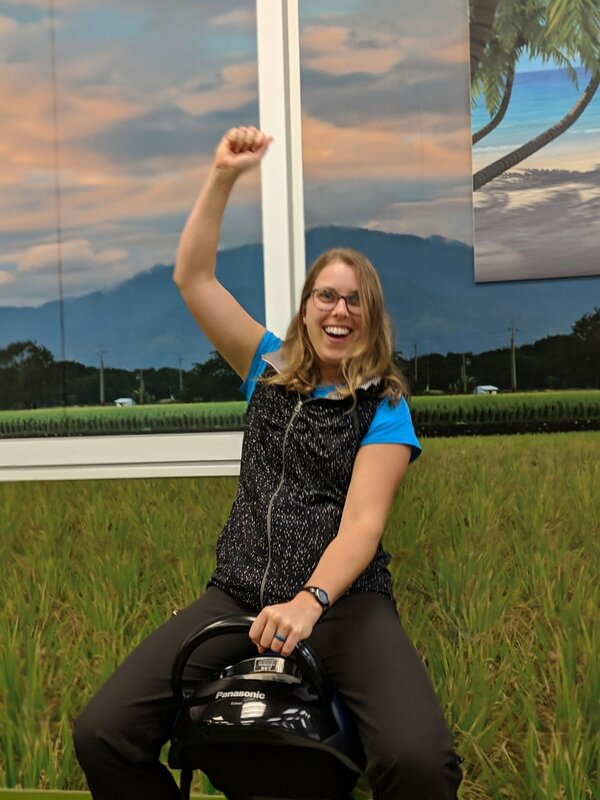 We spent time looking for jobs and thinking about what we want to do once we are done traveling- which will be here so soon! 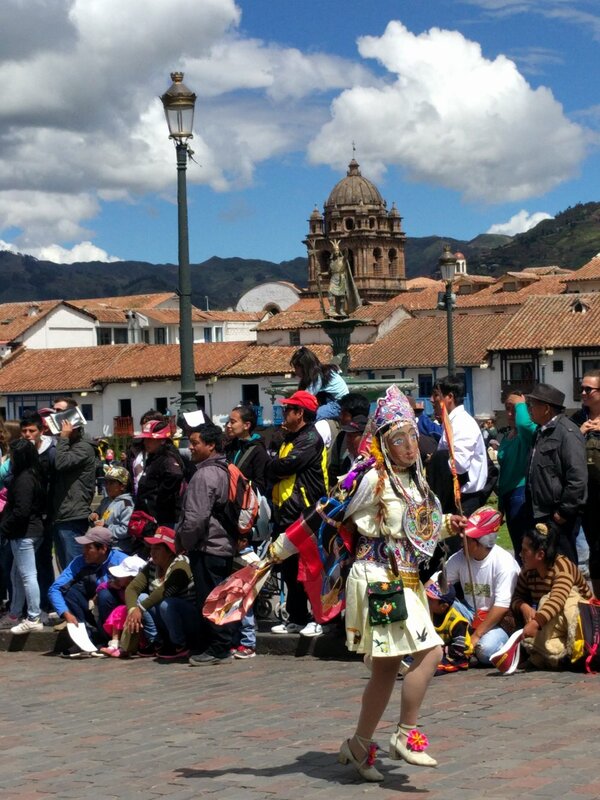 If you are ever traveling through Peru, a day or 2 in this city would be more than enough. 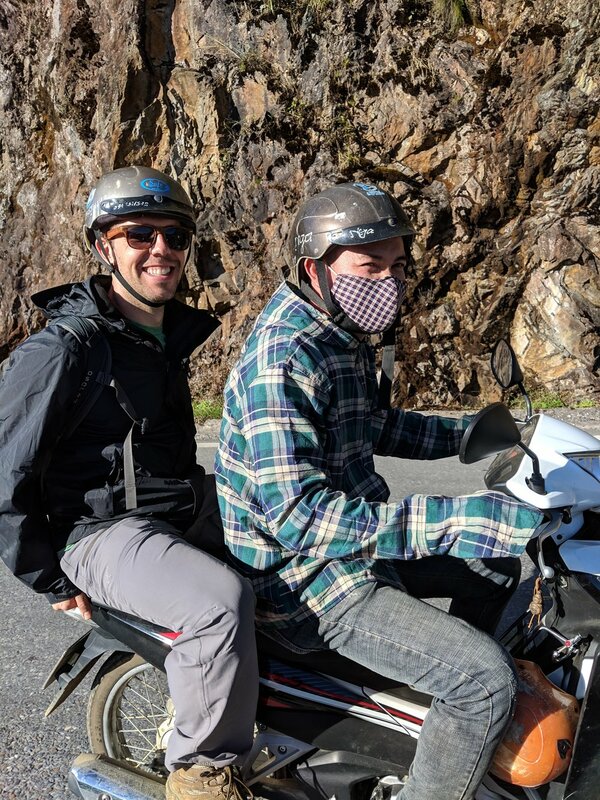 After spending 5 weeks in Peru, both Jeff and I are ready to move on. Our next stop is Stateside!!!!!!!!!!!! 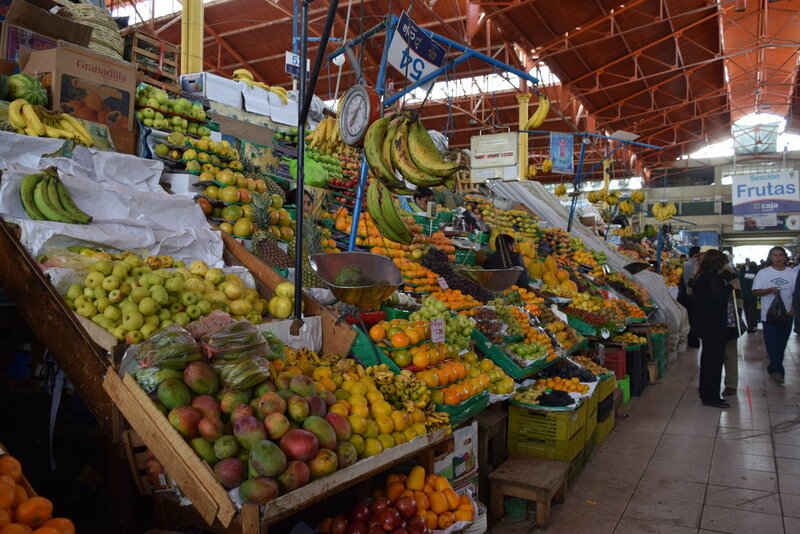 Peru can be very cheap, and it can also be quite expensive, all depending on your tastes. We stayed in some nicer places, but avoided the hotels that clearly were ripping people off. A little research and you can easily tell that most of the hotels are the same quality, but the price can vary a lot. We also knew we had some more money left than we thought we would at this point and used it to fly within Peru, instead of taking the bus. They say time is money and we figured it was worth paying more to fly for an hour or two than take a 12+ hour bus ride. Overall we lived pretty large here but still were barely over our year goal average for the daily amount spent. We don't have much left before the real "end" of the trip, so sometime soon I'll put together some financial numbers for the whole year! From the jungle, we hopped back through Cuzco for 2 nights, and then flew on to Arequipa. Arequipa is one of the largest cities in Peru, and is surrounded by beautiful active volcanoes. 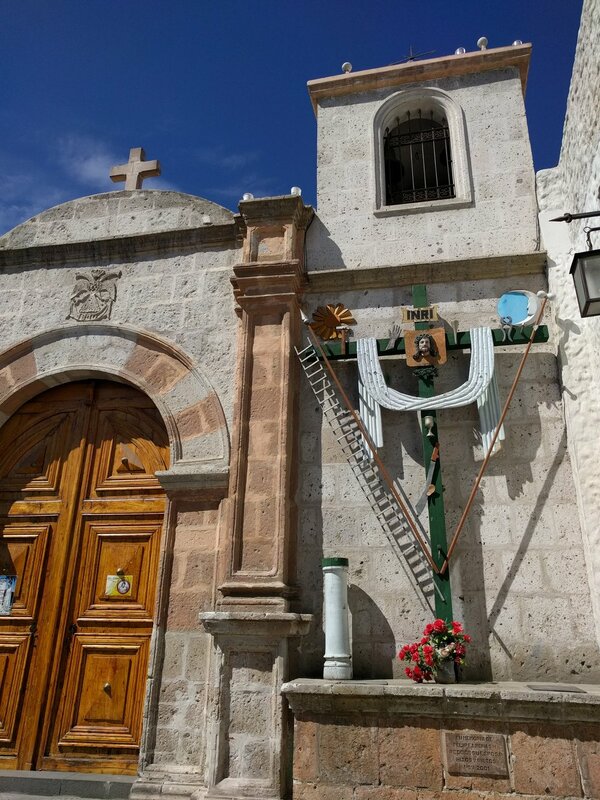 We were pleasantly surprised when we were dropped off at our hotel in Arequipa. Jeff had booked a place for $37/night on booking.com, and based on our past experiences in that price range, we knew the room would be ok (a.k.a. bedbug free, private toilet, maybe some hot water). Luckily for us- the place ended up being a 4 star hotel (by Peruvian standards), and was the nicest place we had stayed in in awhile! 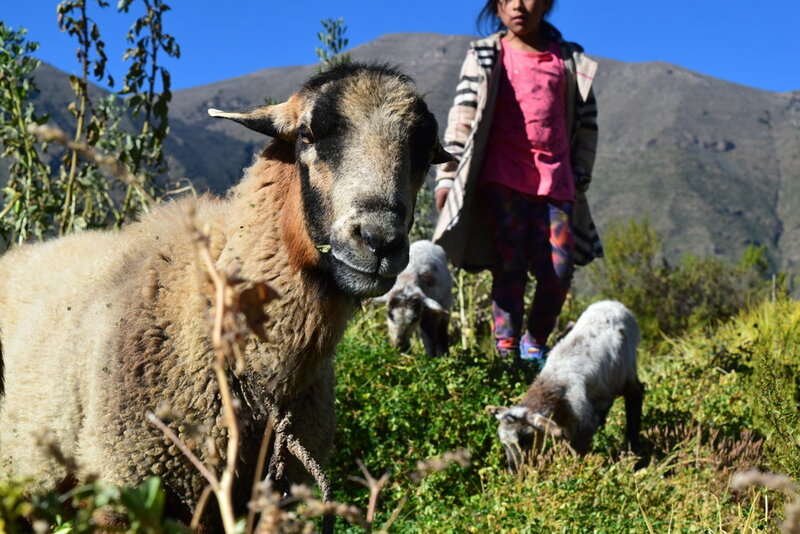 We spent 2 days getting a lay of the land, booking a 3-day trek through the Colca Canyon, taking a free walking tour, and of course- eating! 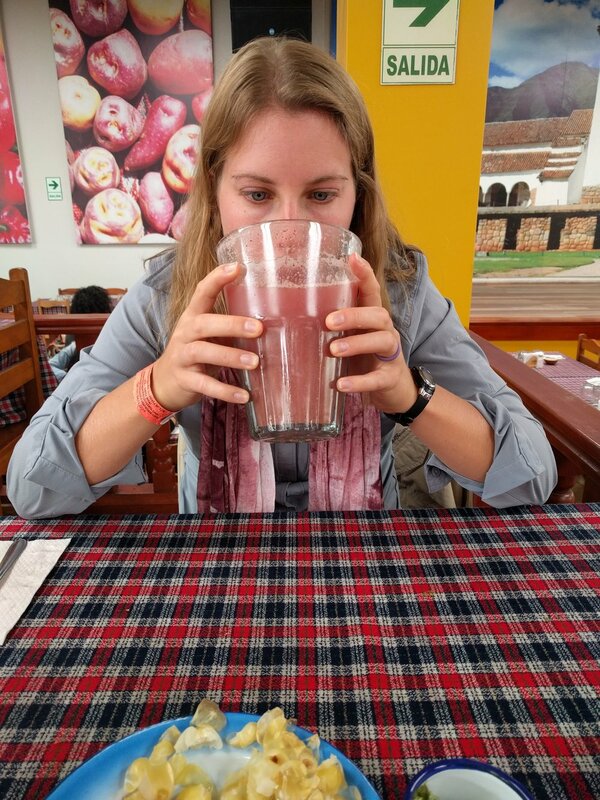 We needed to book a hotel in Arequipa for a few nights after we trekked the canyon, and were disappointed to find out that the nice hotel we were staying in was charging $117/night- a little out of our budget backpacking budget. 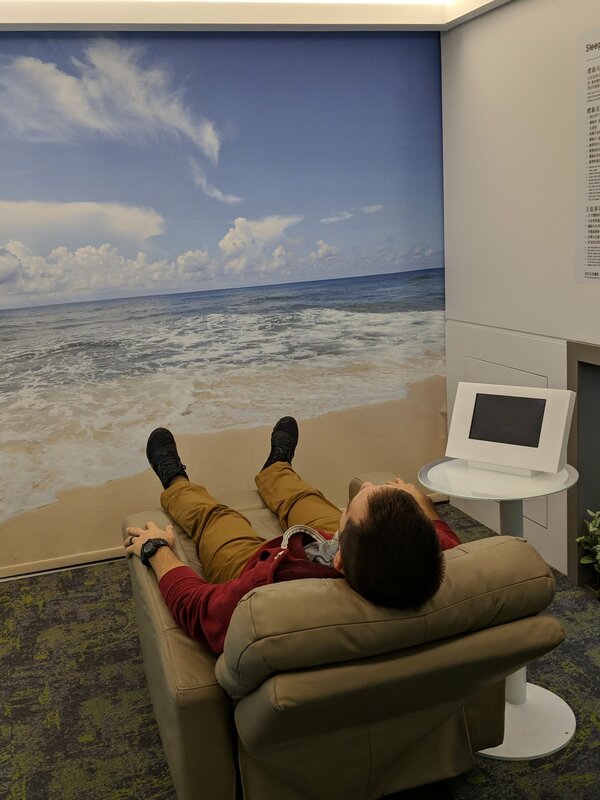 With no rooms available on booking.com, we walked down to the reception desk and asked what the rate would be to book directly. We expected them to quote us the price that was posted on the wall in the lobby ($100/night), but luck was with us again when they told us we could book for the same price of $37/night! We had to ask the front desk multiple times how much it was because I didn’t believe them. An excellent bargain for a private room, super-hot water, good buffet breakfast, and the rooms looked like any decent Marriot at home! Thank you Casona Plaza Arequipa! A big step up from all of the hostels we have been frequenting lately! My smarty-pants husband actually paid attention on the free walking tour we took and won us a free hot chocolate by answering a hard trivia question. I have no recollection what the question was, but the hot chocolate was delicious! 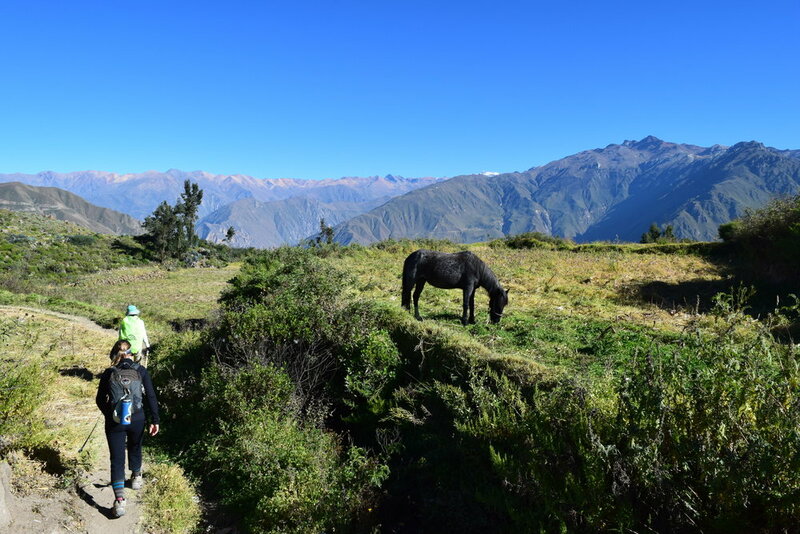 On May 18, we woke up at 3am and loaded up into a van headed for the Colca Canyon. The date is significant because it marked exactly one year since we drove the moving van out of our driveway in Oceanview, Virginia. Flash forward to the present- we got into the 20 passenger van, picked up random gringos from other hotels around town, and sort of slept/got carsick during the 3 hour drive toward Colca Canyon. 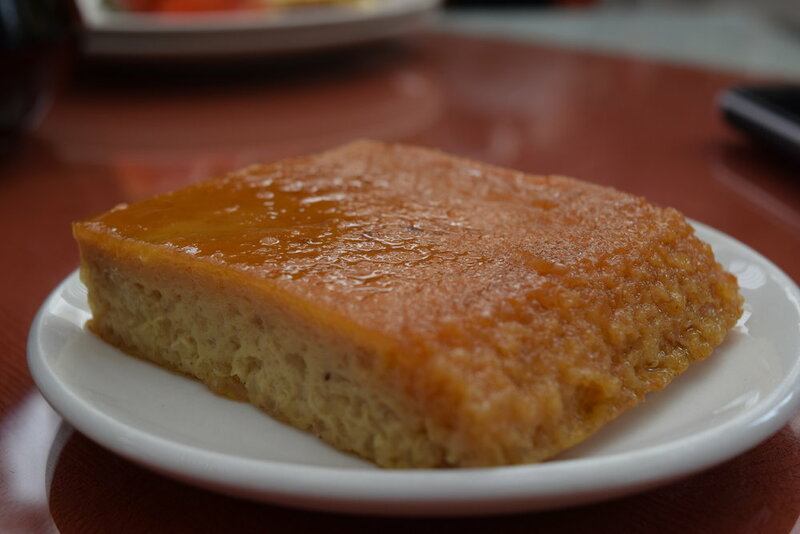 We stopped in Chivay for breakfast around 7:30am, and then continued on to the Cruz del Condor (condor viewing). I’m not sure when it started, but Jeff really has a thing for birds of prey. If I let him, we would have a pet hawk or falcon. (Something about him wanting to train it to hunt…) Anyway, he has been looking forward to seeing the Andean Condors in the wild for a long time (we saw one condor at the zoo in Sydney). And our stop at the lookout did not disappoint! These are some of the biggest (and ugliest, in my opinion) birds in the world. They are from the vulture family, eat dead animals in the area, and live in caves on the side of the canyon. Their wingspan is huge, and really impressive when you see them flying around! From the Cruz del Condor, we drove on to a small village named Cabanaconde where we started our trek. 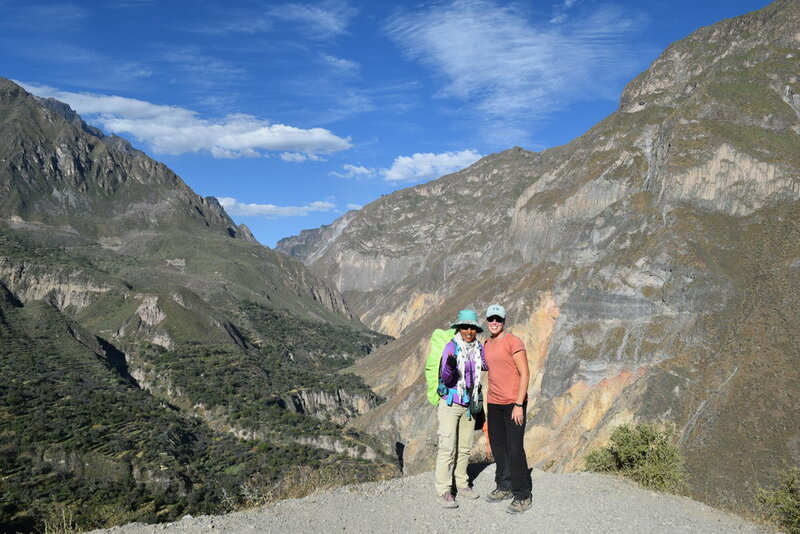 The first day we hiked about 5 hours down into the Colca Canyon, one of the deepest canyons in the world. Our guide, Luz, was amazing! 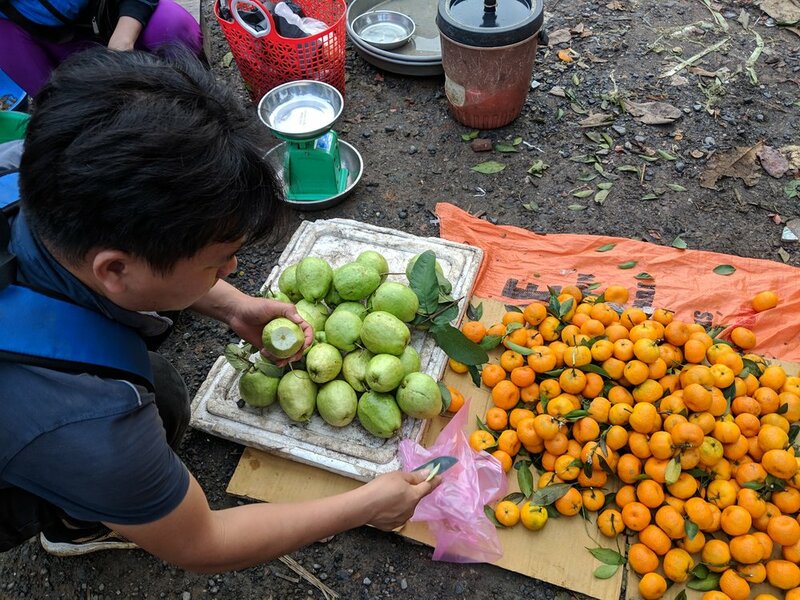 She stopped and taught us so much about the local plants and let us try anything edible along the way. We made it to our ‘lodge’ in the early evening, and spent some time soaking our tired feet in the hot springs. I use the world ‘lodge’ loosely, because we literally slept in a mud/bamboo hut. But it had a real bed! And Luz carried beef all the way into the canyon so we could have a carnivorous meal that night, since the lodge only served vegetarian dishes. (I’m guessing this is due to the fact that the lodge only has power at night via generator, and they have to pack everything in and out with mules). We walked up out of the other side of the canyon the next morning, and made it to a very small village for lunch. After lunch, we stopped by a museum (1-room hut), and using Luz as an interpreter, a lady taught us about local life. She also served us Chicha- the fermented corn drink that is the Peruvian alcoholic beverage of choice. They used to make chicha by chewing up the corn and spitting it into buckets and letting it ferment. Many people have assured me that this is no longer the practice, but the few times that I have tasted chicha here, I’m not convinced. It still tastes weird. From the village we then walked down back into the valley of the canyon to an area called the ‘Oasis.’ There are a few lodges clumped together near the river in the valley, and they all have impressive swimming pools- complete with waterfalls! It’s hilarious because they literally let water from a nearby (real) waterfall feed the pools during the day, and at night, they stop the flow so the pools are empty when no one is using them. We had another nice meal, cold shower, real bed to sleep in, and then we woke up and hit the trail at 5am the next morning for our last day of the trek. After an intense climb, and getting passed by the numerous sissy’s that hired a mule to carry them out, we made it to the top and ate breakfast before getting in our van to return to town. Below: Jeff and I, our guide Luz and I, guinea pigs awaiting the dinner plate, fancy pools in Oasis, flowers on the trail that only open at night, and mules carrying the weaklings (or smart people) out of the canyon. We made a few touristy stops for souvenirs on our way back from the Canyon, and got to soak in more hot springs! There is so much geothermal activity here with all of the volcanoes, that there are hot springs everywhere. 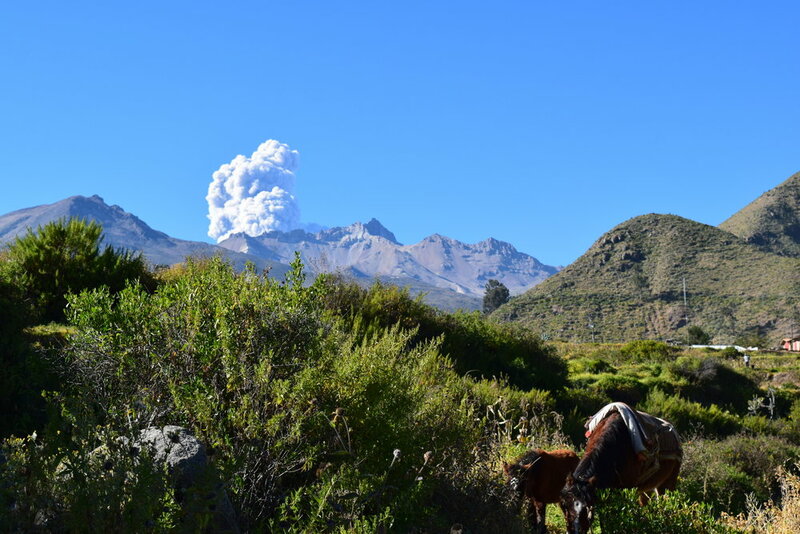 The Sabancaya Volcano was extremely active that day, and we got to see the ash from multiple ‘explosions’ from a few different vantage points. We’ve never seen an active volcano! Note: There is one volcano that is within striking distance from Arequipa, as in- if it erupts, it will kill everyone in town. It’s something like, hundreds of years overdue to erupt, but people in town told us that they have emergency procedures to follow. Below: active volcano, sights along the trail, and me relaxing in the hot springs! We spent 2 more days in Arequipa after our trek relaxing. We visited the Museo Santuarios Andions UCSM, which houses ‘Juanita.’ Juanita is an extremely well preserved corpse of a young teenage girl that was found on top of the Ampato Volcano in Arequipa. She was sacrificed to the Incan gods around 1470 AD on top of the volcano. She is one of multiple children that have been found sacrificed on top of mountains all over Incan South America. It was fascinating, if a bit morbid, to learn more about Incan culture, and the museum had an excellent display of artifacts. The next day, we took a cooking class at the Peruvian Cooking Experience. 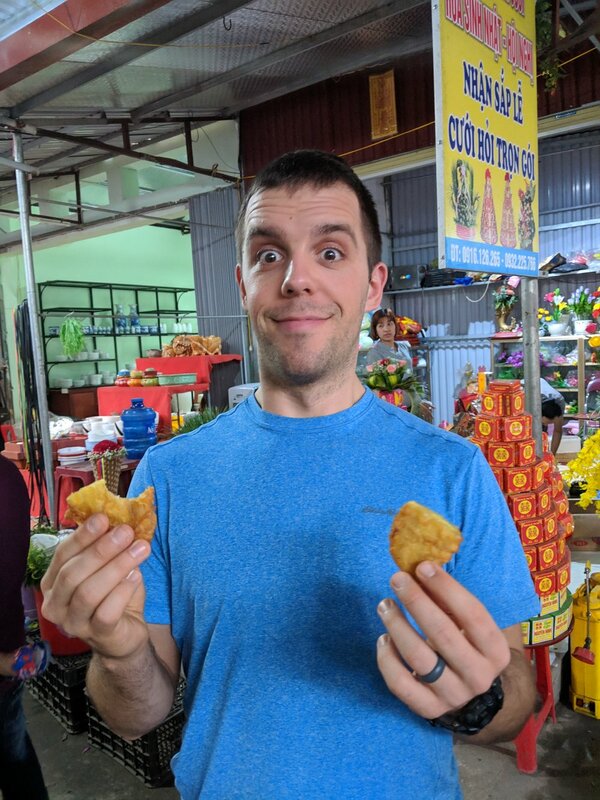 No one else had signed up for class that morning, so Jeff and I had a private tour of the market with our guide, Lady, and then we got cooking! 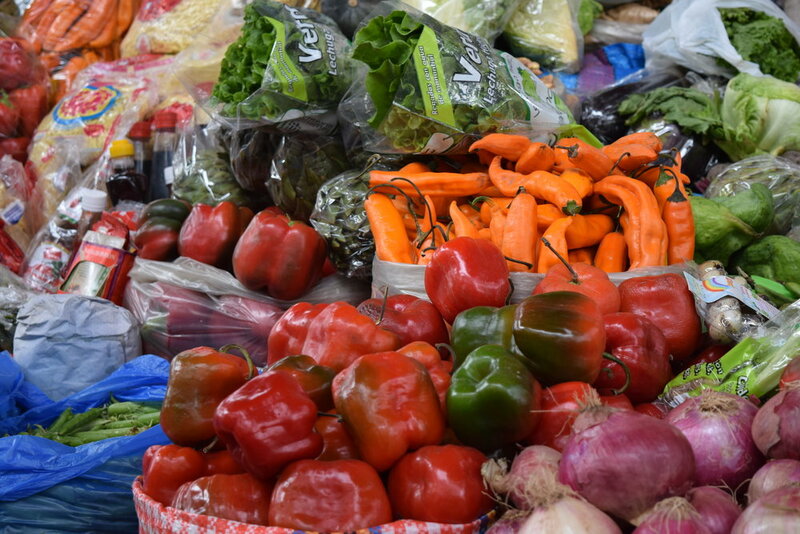 Below are some photos from the market- Peru grows something like 3,200 different kinds of potatoes (this is not an exaggeration), a woman pouring some hot sauce for us to cook with, and good looking fruits and veggies. I'm going to miss being able to buy fresh produce in markets like this! 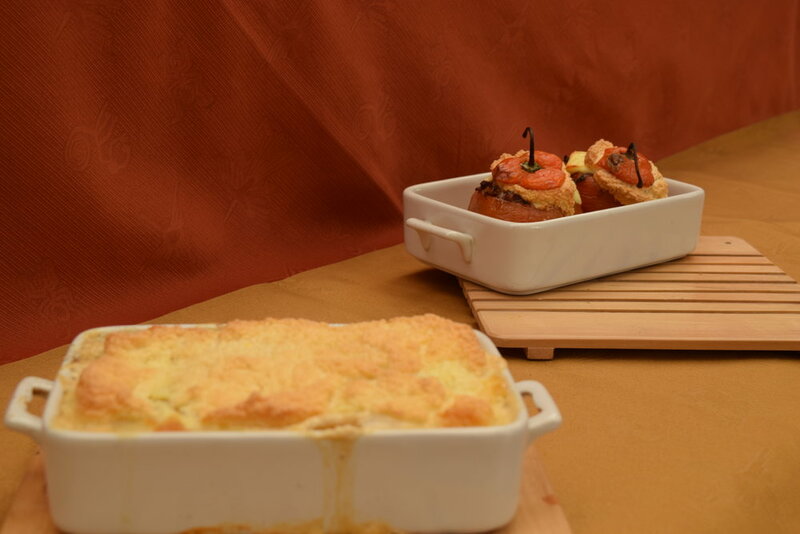 We made saltero de queso (cheese salad) for an appetizer, potato pie (kind of like a potato au gratin), rocoto rellenos (stuffed hot peppers), and quinoa flan for dessert. It was DELICIOUS! 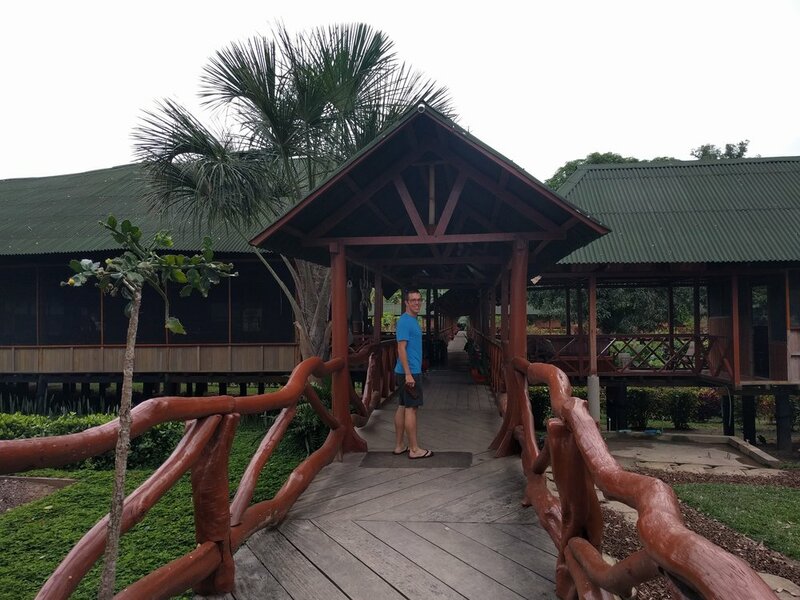 During our time in Cusco, we booked a 4-night stay in a jungle lodge just outside of Puerto Maldonado. Just like trekking, I am extremely sick (carsick) of taking buses. I was pleased to find out that domestic flights in Peru are fairly cheap, so we are flying to all of our destinations in Peru! Jeff had done a little bit of research on different lodges, but we didn’t ask many questions about what activities we would be doing in the jungle. At this point, we are so go-with-the-flow that nothing really phases us. They could have told us that we were supposed to scavenge for food in the jungle and we would be cool with it (luckily, that didn’t happen). Both of us are pretty tired of planning activities, and are willing to throw money at someone and have them tell us what to do! We flew into Puerto Maldonado and were picked up at the airport by Eco Amazonia staff (the lodge we booked). They took us into town and let us explore the town and market. After seeing the small town, we were glad that we did not book an extra night there- there isn’t anything going on in Puerto Maldonado! 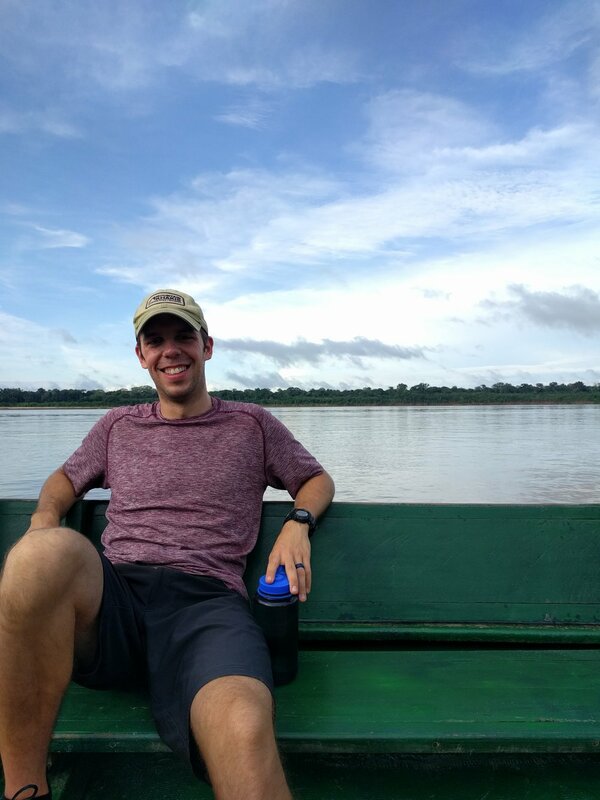 Around 1:30pm, we were bused to the river and hopped on a boat and cruised for an hour and a half downstream to the lodge. Even though we paid a considerable amount of money for the 5 days ($505 pp), this is Peru, so we weren’t expecting much. We were pleasantly surprised when we arrived and were greeted with welcome drinks and a delicious buffet lunch! We had great food for the few days we were there and our little cabin was great! 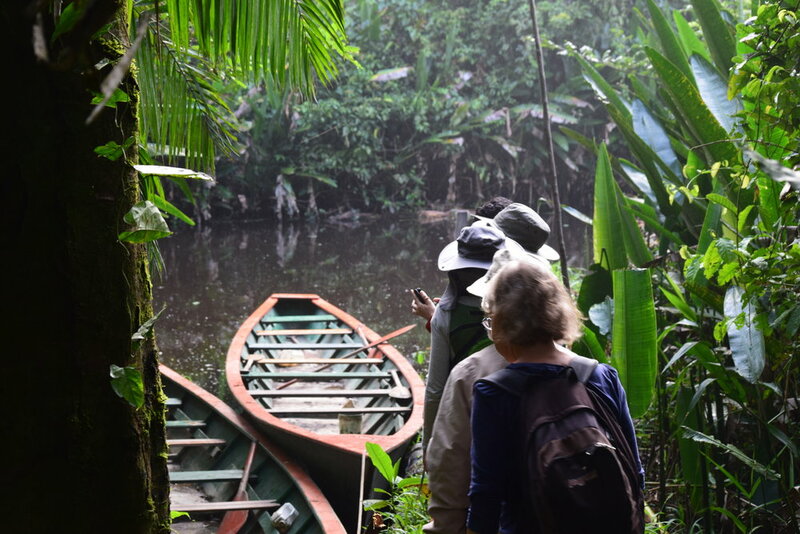 We went on guided excursions in the mornings and the afternoons- sometimes hiking and sometimes by boat. Our guide David, was awesome! 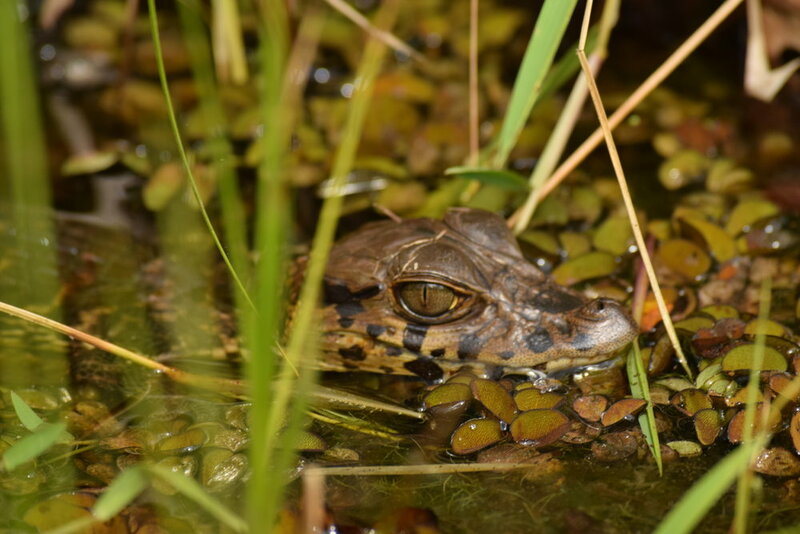 He spotted some crazy things- small frogs and a baby anaconda for example, and taught us about local plants. Our guide taught us a lot about local flora and fauna. He showed us that the spikes from a certain type of palm tree could be used for blow darts. Our guide LOVED to pick up scary looking bugs (fire ants included), and crush up weird plants and let us rub them on our skin. I’m not sure exactly what the war paint was used for. 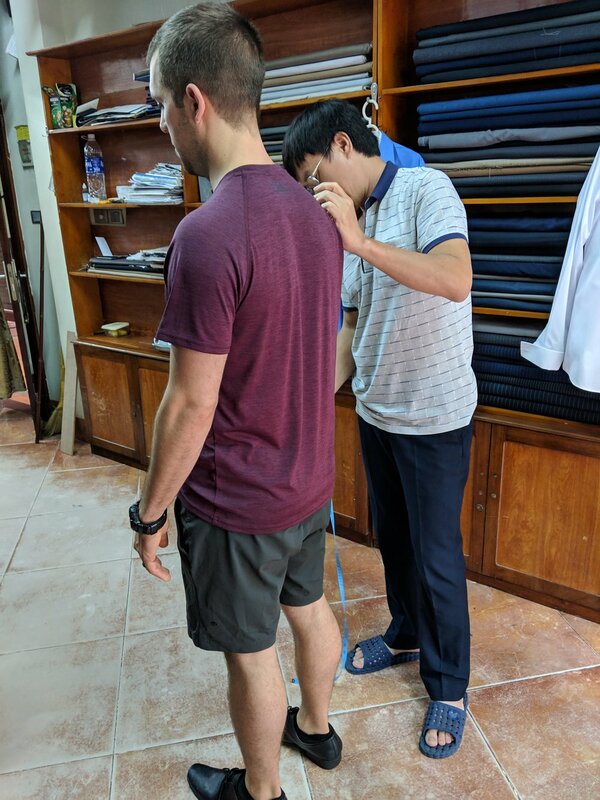 Maybe mosquito repellant, or maybe David just wanted us to look like the indigenous people….which is my guess based on the number of bug bites I had. One afternoon we took a short boat ride to 'Monkey Island,' right across from the lodge. We fed the monkeys bananas! 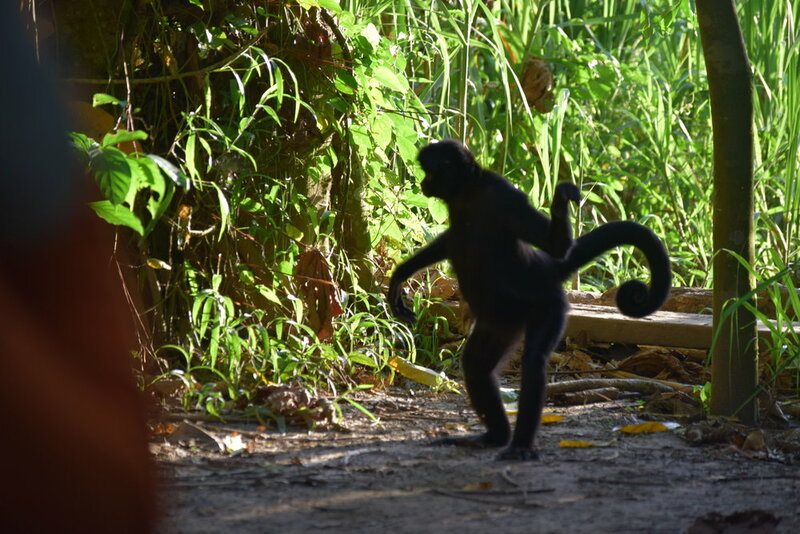 There was one group of brown and black capuchin monkeys, and only 5 spider monkeys. These monkeys had been rescued from the black market, and used to be domesticated, so Jeff and I felt a little bit better about feeding the wildlife. We enjoyed being off the grid again- electricity only ran for a few hours at night, and we relaxed in the hammocks by the river, and Jeff played soccer in the evenings with the guides. 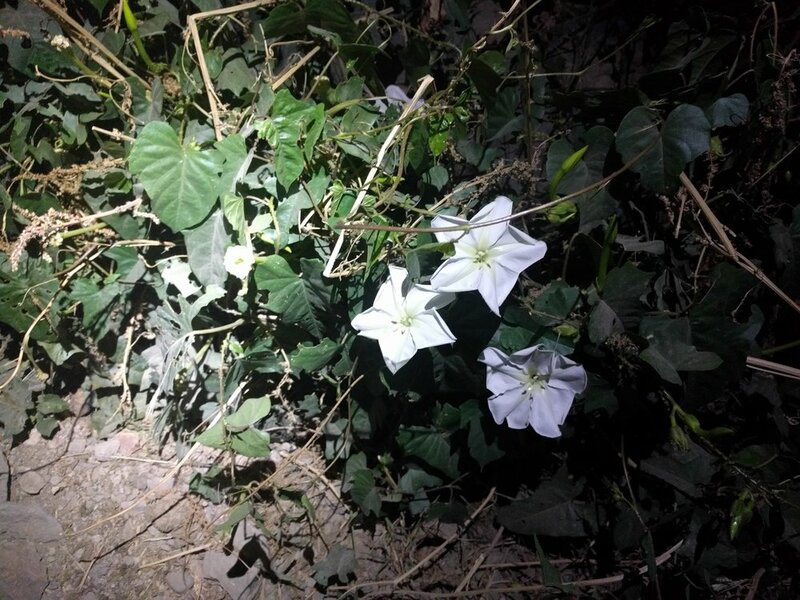 Every night we would walk out to the welcome sign and see the tarantula that lived there! The Madre del Dios river that the lodge is on runs through Bolivia and then on to Brazil where it meets up with the Amazon before dumping into the Atlantic Ocean. 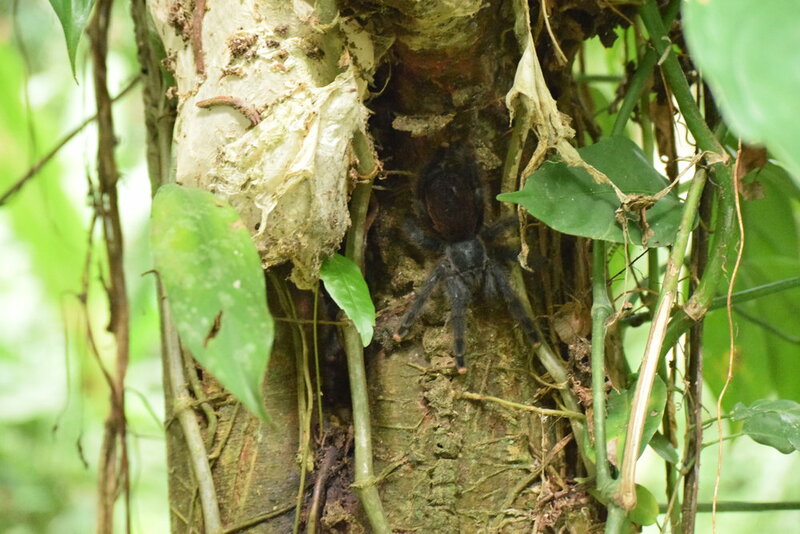 It was great to see so much tropical wildlife. 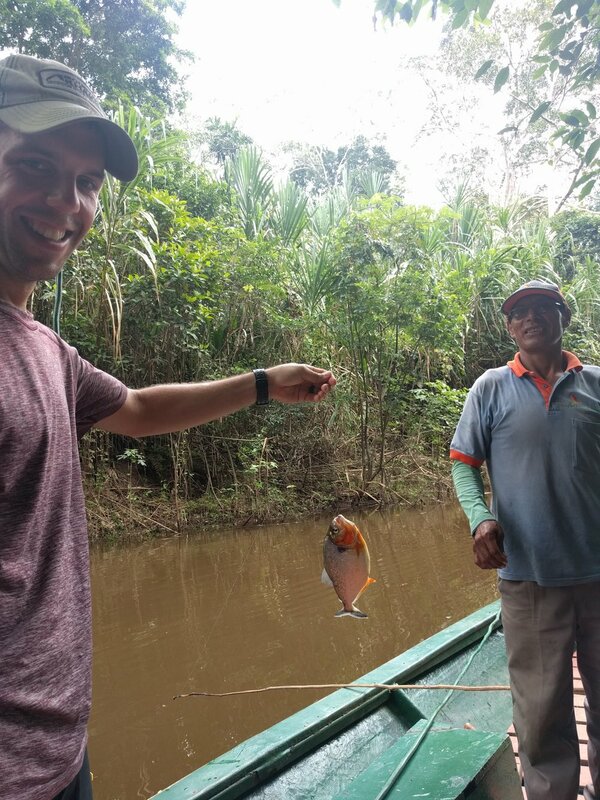 On our last full day at the lodge, we went fishing for piranhas! Only our boat driver and our guide ended up catching piranhas, but I snagged a duck fish, and Jeff caught a baby duck fish. Duck fish might be a type of catfish (they call most fish ‘catfish’ here if they do not have scales). The best part was that we took the fish back to the lodge and the cook fried them up for our dinner! Jeff and I both liked the taste of the piranha the best. Delicious! 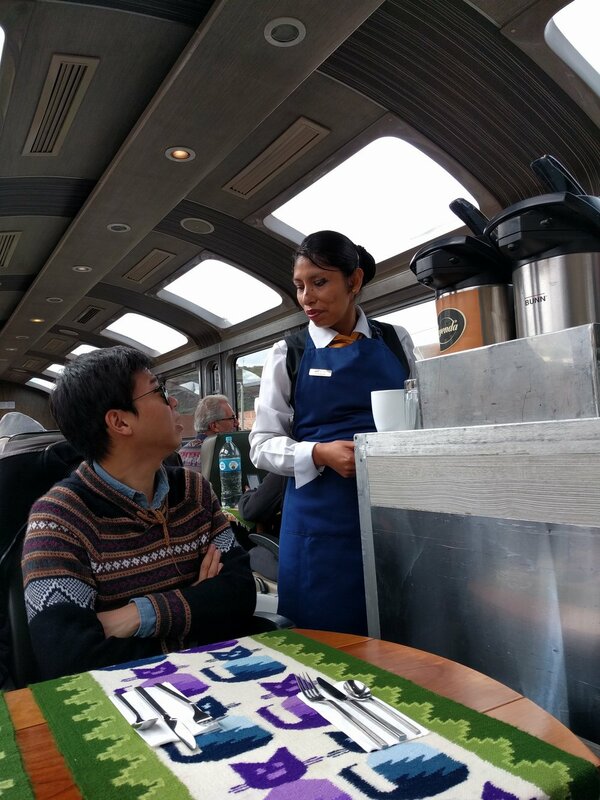 We left Cuzco on a Sunday morning and took the train to Aguas Calientes (Machu Picchu Pueblo). Many people trek to Machu Picchu, but we didn’t have any hiking gear with us. 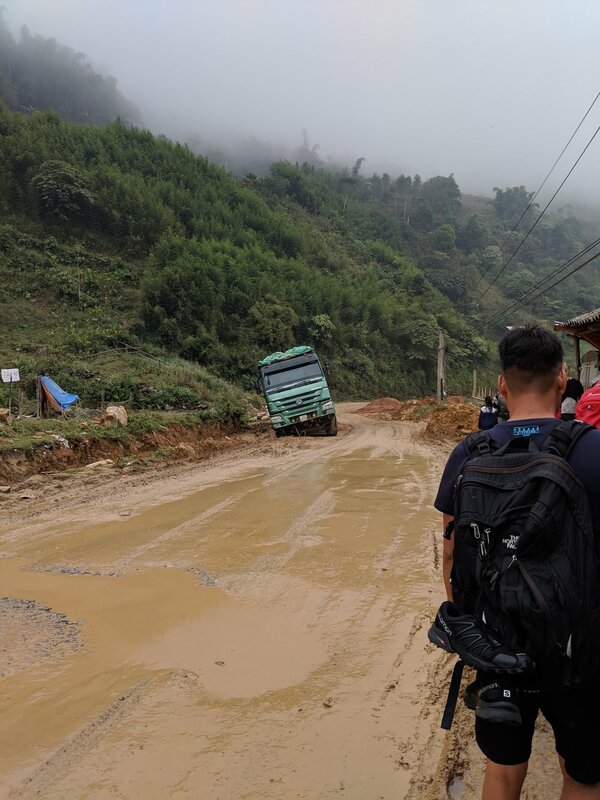 We could have rented gear, but to be honest, trekking and camping in the cool, wet weather just didn’t sound fun to either of us. Jeff sprung for the expensive train tickets (about $80 each, one way) so we were treated to a commentary during the ride, windows in the ceilings of the railcars, and a full meal. This was probably the nicest train ride we have ever been on! That afternoon, we walked outside of town and went to a museum to learn a little bit more about Machu Picchu since we weren’t planning on hiring a guide to show us the ruins, and we knew there wouldn’t be any posted information anywhere else. After dinner, we went to bed early since we would have to get up around 4am the next day to head up to the ruins! Again, opting out of hiking the hour and half straight up to Machu Picchu, we got in line before 5am to ride the bus up to the ruins ($24 pp/round trip). Buses started running around 5:30am, and we were to the top a little before 6:30am. Once we got through the gate, we slowly made our way over to Wayna Picchu (also spelled Huayna Picchu). 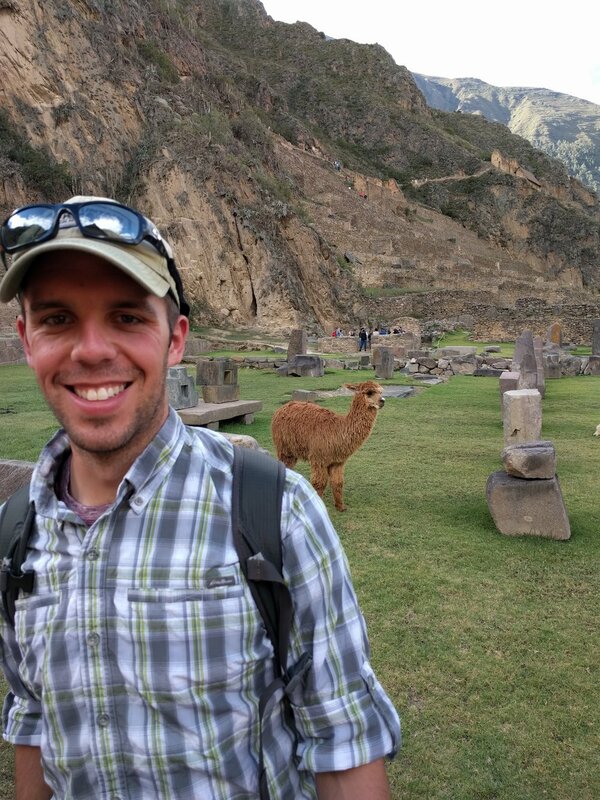 Jeff had purchased our Machu Picchu tickets a few weeks ago while we were in Australia. 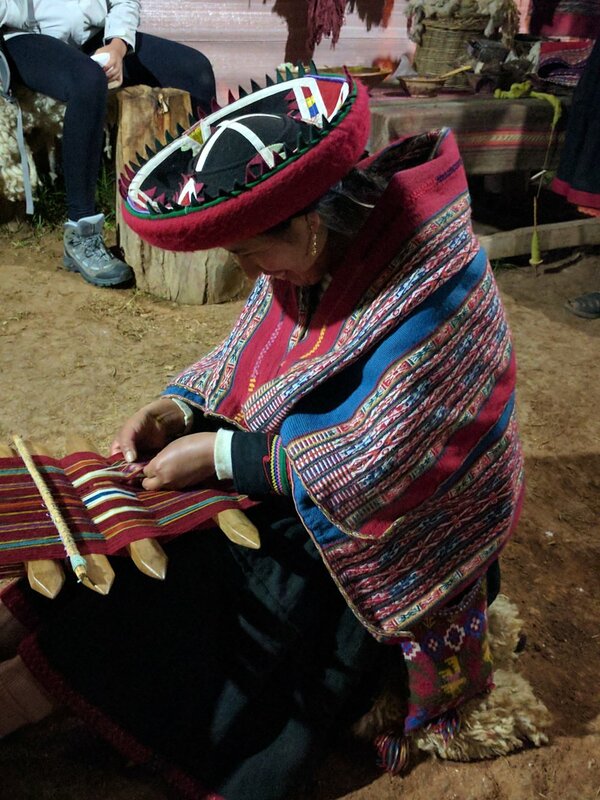 It wasn’t completely necessary to do that (you could have gotten tickets in town easily), but it did mean that we were able to get special tickets to hike Wayna Picchu, which does sell out since they cap the number of visitors. The ruins sit in between Machu Picchu Mountain and Wayna Picchu Moutain, so going up one of these offers a different vantage point. A friend (thank you Krissy! ), recommended we hike Wayna Picchu, and we are so glad we did! Below: the first picture is the view of the ruins from the top of Wayna Picchu, and the others are facing Wayna Picchu- we hiked all the way to the top! I swear I'm not standing in front of a green screen! It was a pretty strenuous climb (maybe it would have been easier if we were in shape? ), and we opted to do the longer hike around the entire mountain in order to see a cave that was supposedly a temple for the moon (based on the direction it faces). We spent the rest of the morning exploring the ruins and headed back to town around 2 pm. Our train didn’t leave until the afternoon the next day, so we had to get creative with how we spent our time. 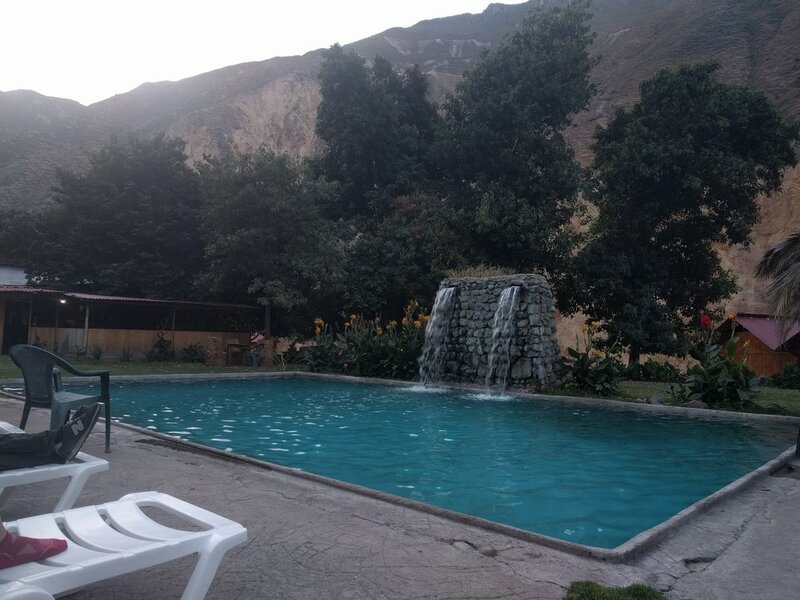 Note: 2 nights in Aguas Calientes is plenty! We walked up to the hot springs that the city is named after (aguas calientes = hot water), paid a few soles, and bathed in the hot tubs. Afterwards, we ate our way around town, stopping in a few restaurants and cafes. We are incredibly lucky that we had amazing weather to see Machu Picchu. The ruins were amazing and definitely lived up to the hype. We would highly recommend it to anyone who wants to travel to South America! Our flight pattern from Hawaii went like this: Honolulu->Houston->Panama City, Panama (9 hour layover)->Lima, Peru->Cuzco, Peru. 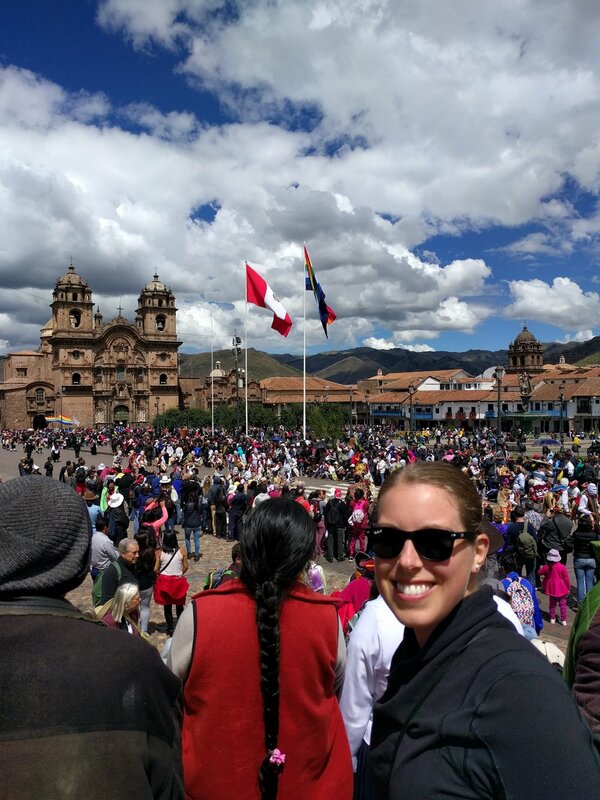 Over 36 hours after we left Hawaii, we were in Cuzco! Note: even though it was a really crappy 2 travel days, we can’t complain. We purchased these tickets for 25,000 United miles +$20. We arrived to Cusco safely, maybe a little ripped off by the cab driver (what’s 10 soles anyway? ), and settled into our hostel where we had the next 10 nights booked. Do you know what we did for the next 10 days? NOTHING. And it was great! Jeff is really good at being content staying in one part of a city and not doing anything. Normally I am itching to go see everything because I don’t want to miss out. FOMO is real. But in this case, we had been traveling constantly since we left Cambodia at the end of February, and it was time to slow down. There is no way that ingesting neon yellow liquid is good for you. 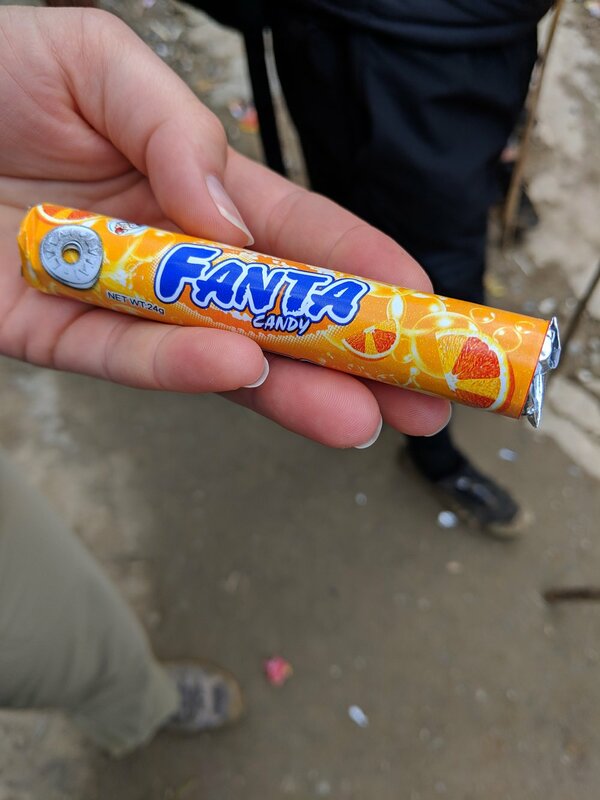 Good thing it tastes delicious! 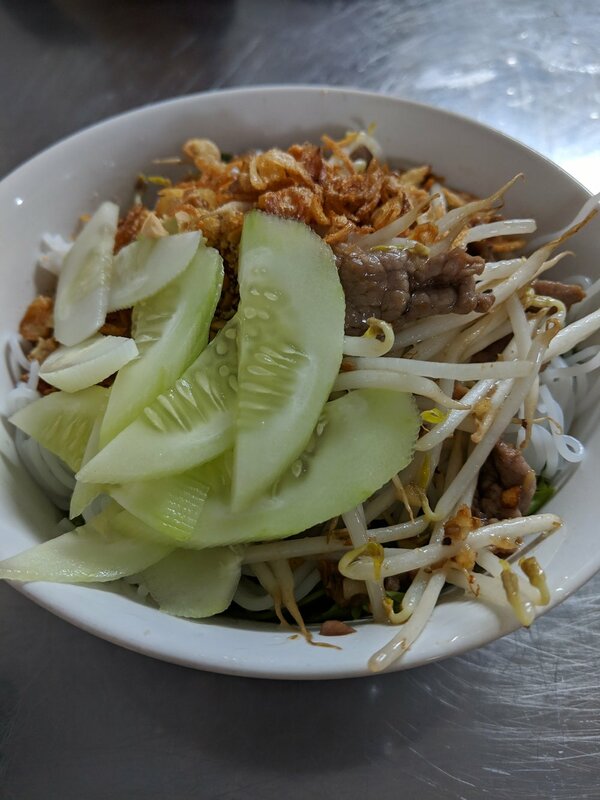 We also received a restaurant recommendation from a local, so we checked it out. We showed up for a late lunch and were pleasantly surprised that entertainment accompanied our meal! On Sunday, we showed up in time for the 9am mass in the city center, but we ended up walking in during communion. We think they were running behind from the previous mass. Anyway, the whole operation seemed like a free-for-all, so we got blessed and quickly returned to the main square where it seemed like a parade was in the making. It ended up being a huge event! Poor Jeff, he’s not a big fan of parades, and I made him sit there for an hour and 20 minutes before we got up. It ended up being a bunch of marching labor unions, military, and random working groups. The best part was at the end, when many cultural groups were dancing! 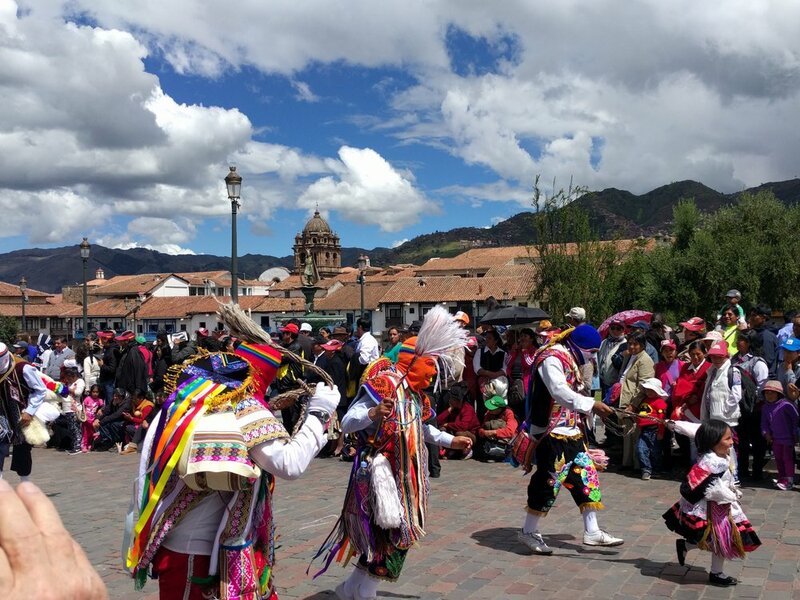 Through our hostel, Cusco Packers, we were able to book a few day trips around Cusco in order to see some of the Incan Ruins. 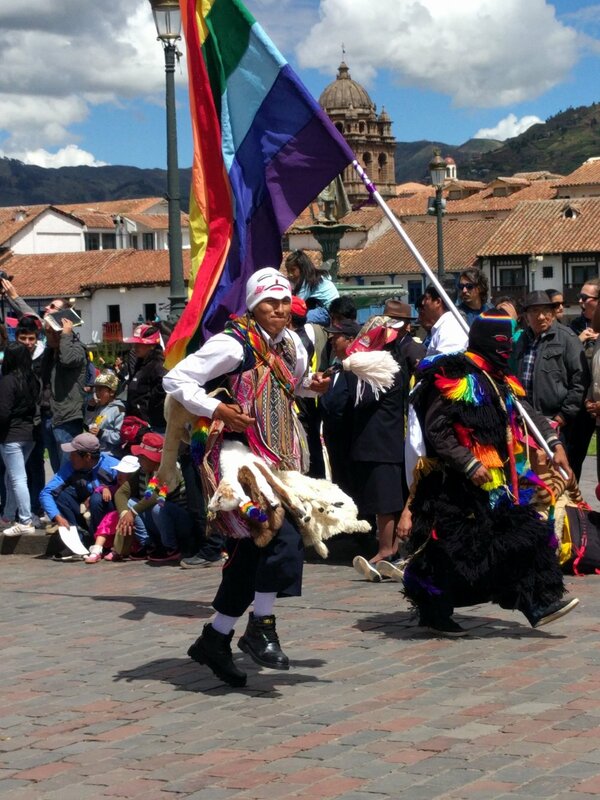 We did a long day tour of the Sacred Valley and visited ruins in Pisac, Ollantaytambo and Chinchero. 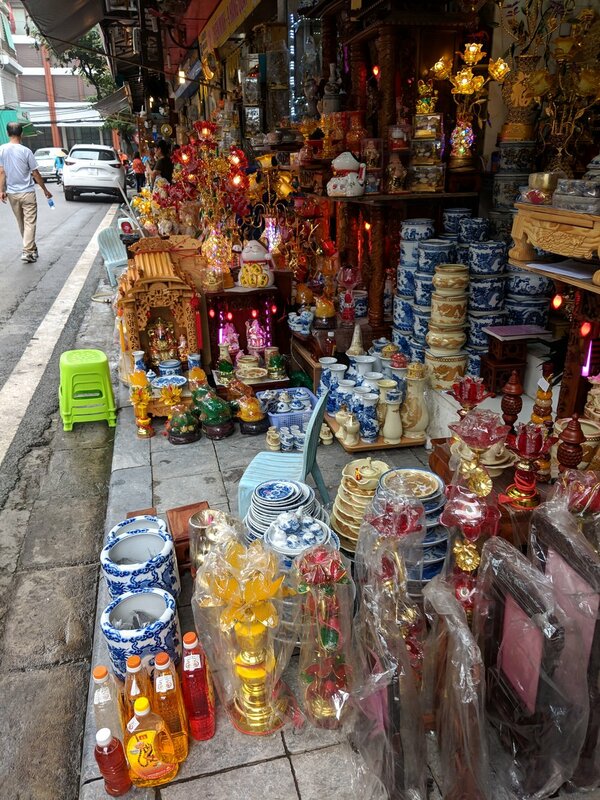 Of course, on a big bus tour you have to put up with a few stops at handicraft markets, but for $20 each, plus a huge buffet lunch, it was an awesome way to spend a day! Our guide spoke great English, and we learned a lot! They next day we went on a shorter day trip to the archaeological site of Moray, and the salt ponds in Maras. It was nice to see different ruins and the salt mine, but this tour wasn’t as good as the previous day. It didn’t help that our tour guide spoke poor English (which was ok- especially since we can both understand a little bit of Spanish), but he was point-blank telling us false information- like that the Inkas built the salt mine 400 years before Christ. Um…there weren’t any Inka’s around then…much less in South America. This was not a translation error on his part, he said the exact same thing in Spanish, even when I called him out on it. You win some, you lose some I guess! The scenery was awesome though, and the rain held out so we had perfect weather! Moray (above) was constructed to worship and celebrate fertility, and is supposedly shaped like an ovary. Again- this from the guide who didn’t know when the Inka’s existed. 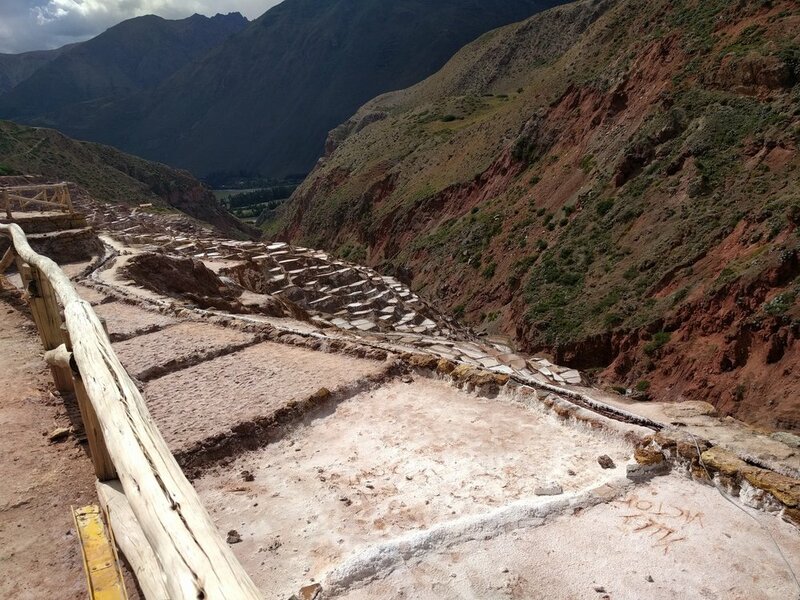 Take it with a grain of salt… but the Inka’s did construct the terraces all over the place to grow crops. 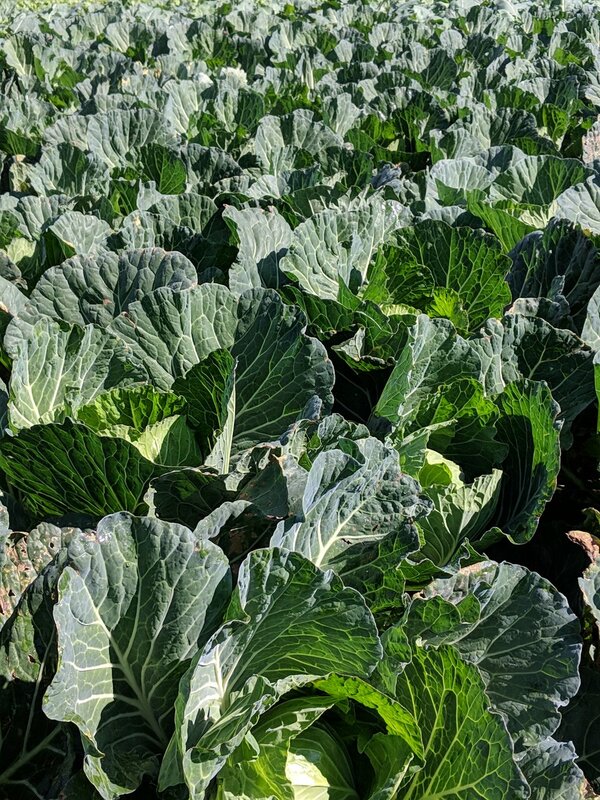 These crop circles grew everything from medicinal plants, to grains and potatoes. The salt mine is pictured above. The salt water coming from a natural spring in the mountains contains a concentration of salt that is less than ocean water (I tasted it, I can vouch for it), which makes it perfect to collect in small pools after the water evaporates. It is then taken into town and processed for table salt.